This paper is written by both Wei-hsing Huang (principle consultant at SPISim USA) and Wei-kai Shih, who is Tokyo based. Here in US, one of IBIS committee’s working groups, IBIS-ATM (advanced technology modeling) has regular meeting on Tue. I try to call-in whenever possible to gain insights on upcoming modeling trends. During mid 2018, DDR5 related topics were brought up: Existing AMI reference flow described in the spec. focuses on differential or SERDES. For example, the stimulus waveform is from -0.5 to 0.5 and/or a single impulse response is used for analysis, thus assuming symmetric rise time (Rt) and fall time (Ft) mostly. Whether this reference flow can be applied to DDR, which may have asymmetric Rt/Ft and single-ended like DQ, is the center of discussion. Different EDA companies in this work group have different opinions. Some think the flow can be used directly with minimal change while others think the flow has fundamental shortcomings for DDR. Thing about IBIS spec. change is that whoever think the current version has deficiencies needs to write a “buffer issue resolution document (BIRD)”. Doing so will inevitably disclose some of the trade secrets or expose shortcoming of the the tool. As a result, while there are companies which think change may be needed, no flow change have been proposed at this point. As a model maker, I wonder then how existing flow can be applied to DDR without major change? Thus this study is to demonstrate “one” possible implementation. 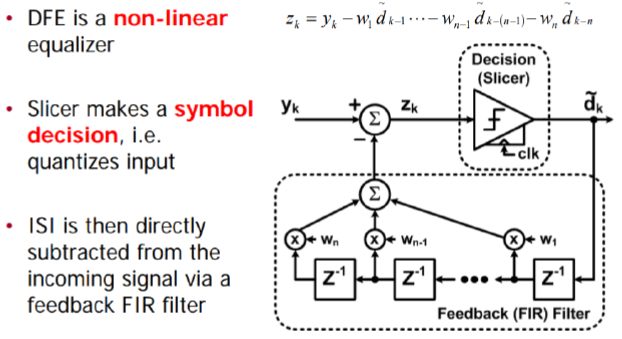 Existing EDA companies may have more sophisticated algorithms/implementations to support this asymmetric condition, but the existence of “one” such possible flow may convince model makers that it’s time to think about how DDR AMI may be implemented rather than waiting for the unlikely spec. change. There are both “statistical” and “bit-by-bit” flows in channel analysis. 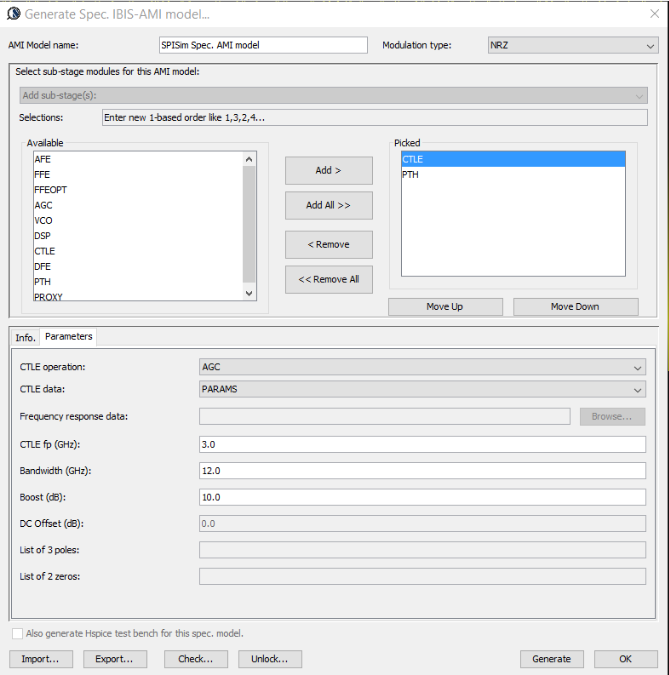 In either case, the first step an EDA tool will do before calling AMI model is “channel calibration”. According to the spec. the impulse response of the channel, which includes analog buffer, is obtained here. For a SERDES design which has no asymmetric Rt/Ft issue, this impulse is then sent to TX AMI followed by RX AMI, resulting impulse response is then calculated using probability density function (PDF), integrated to be cumulative density function (CDF), then obtain bathtub plots etc. The textbook definition of an impulse response is from a “delta response” input which happens at the infinite small time step. In real situation, there is no such thing as an “infinite small time step”. The minimal step used by a simulator is a “time step” which is usually 1ps or more. Buffer will not toggle from low to high back to low in a single time step. So in reality, simulator often uses step response then take derivative to get impulse response. Now the problem comes: for an analog channel with asymmetric Rt/Ft, these two step response (ignoring the sign) are different. That means we will have two different impulse response, then which one should be send to AMI models? A note here up front is that it’s EDA tool which sets up the calibration, so it has any nodal information, such as pad of Tx and Rx analog buffer, if needed. One may think that there is no such limitation that an AMI model can only be called once. 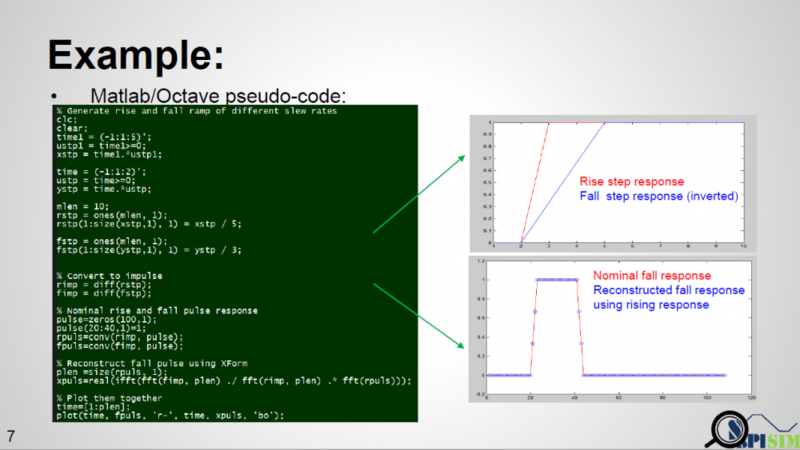 So theoretically, a simulator can run analysis flow twice… impulse calculated from rising step response is used for the first time and the one from falling step response is used for the second time. However, not only is this not efficient, a model may not be implemented properly such that calling AMI_Init again right after AMI_Close may cause crash if it’s in the same process and model pointer was not released completely. Thus doing so may hamper a simulator’s robustness. As depicted in the picture above… if a simulator uses a long UI pulse to calibrate the channel, then both rising and falling step response are included in one simulation. 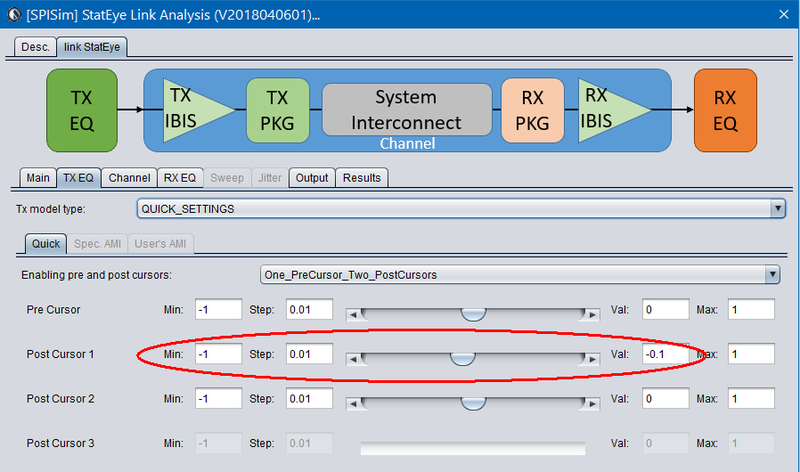 Now let the data captured at Tx analog pad as X1 and X2 for rising and falling portion respectively, the data captured at Rx analog pad Y1 and Y2 will be X1 and X2 convolved with interconnect’s transfer function, which is LTI. If we derive a Xform(t) which is transfer function between X1 and X2, then that Xform(t) should also be able to transform between Y1 and Y2. 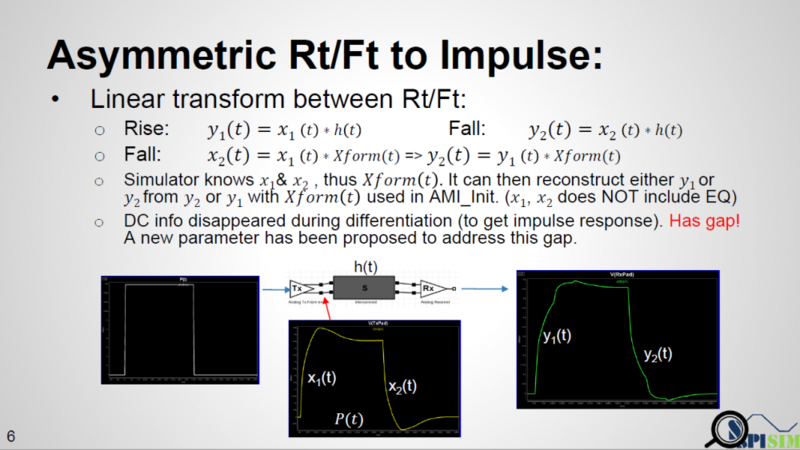 That means if a simulator can calculate Xform(t) it self, then regardless the impulse response it sent to AMI models is calculated from rising or falling step response, it can always “reconstruct” the result from the other type of impulse response using this Xform(t) function. To prove this concept, we have written a simple matlab script taking step inputs of different slew rate, say inp1 and inp2. It calculates the Xform(t) function from both inputs and then reconstruct the response out2′ from out1. When overlaying nominal output out2 and reconstructed out2′ together, we can see that they match very well, thus prove the concept. 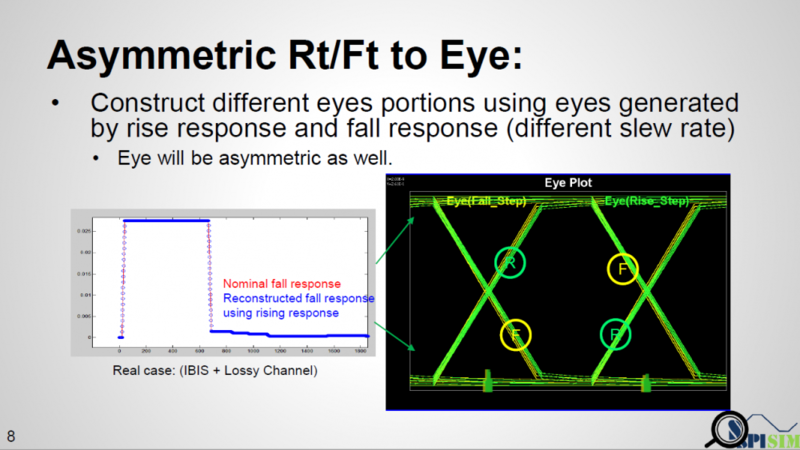 Once we have response from both different slew rates, we can construct their respective eyes then use each one’s different portion to construct a synthesized eye. Such eye will not be symmetric like that calculated from SERDES. When calculating PDF for asymmetric case, one may also need to consider the precedent bit’s value and use a tree like structure to keep track of possible bit sequence. For example, for a typical SERDES bit sequence, if encoding is not considered, each bit will have 50% one and 50% zero. PDF is constructed based on that assumption. But in an asymmetric case, if the data used at the cursor is from rising response, then the cursor bit must be 1 while (cursor – 1) must be zero. If (cursor – 2) is 1 again, then the tail of falling response at (cursor – 1) will be superimposed to the cursor data. That is, we can’t treat each bit to have same 50% probability when constructing PDF. It’s not a binomial distribution as each occurrence is not independent. A simulator may need to determine the maximum bit length to keep track of first, then based on that depth to form tree-like sequence which leads to the rising or falling steps at the cursor location. Finally use superimpose to construct the overall response. 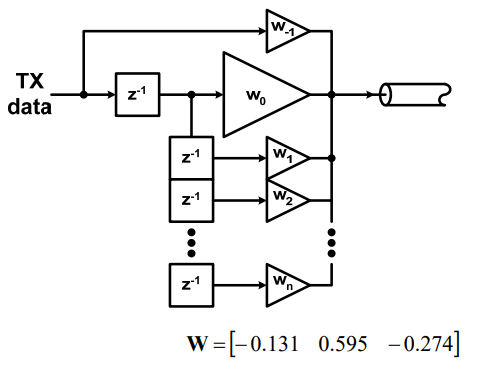 According to the reference flow for the bit-by-bit case: equalized Tx output from digital bit sequence is converted with channel’s impulse response. The resulting waveform is then sent to Rx EQ before getting final results. Either Tx EQ or Rx EQ or both may not be LTI so usage of aforementioned Xform(t) is not applicable. As a fruit of thought… the spec. only mentions that in a bit-by-bit mode, the output of Tx AMI model is equalized digital sequence, while input to the Rx EQ must be the channel response from that sequence, then are there other ways to get such response to Rx yet with different Rt/Ft considered? One example is like shown in top half of the picture above. If a simulator takes that equalized digital input and “simulate” to get final response, then this “simulation process” should have taken different Rt/Ft into account and has valid results. However, this process will be slow and I don’t think any simulator is doing it this way. Furthermore, the spec. specifically say it needs to “convolve” with impulse response. First of all, this impulse can be from rising or falling. Secondly, even we decide to decovolve with input first (thus has sequences of different delta response) then convolve with pulse response (i.e. one simulated UI), will there be any issue? From the plot above… we can see that when a pulse has different rising and falling slew rate, using superimpose to construct 011… will find “glitches” at the trailing high state portion. The severity of this “glitches” depends on how much difference the Rt/Ft is. So using a pulse response here will still not work. A simple matlab script has also been written to demonstrate occurrence of such “glitches”. This proves that not only using an impulse response to convolve with Tx EQ’s output is problematic, even using a full simulated pulse (which has asymmetric Rt/Ft’s effect) to convolve delta sequences (this delta sequence is original TX EQ’s output deconvolve with one digital bit) will still be problematic. Glitches will happen for consecutive ones or zeros due to the mismatches of Rt and Ft. Thus one must use rise step and fall step response instead when doing such kind of convolution. In this presentation, we discussed how existing AMI flow may be applied to asymmetric Rt/Ft such as those often seen in DDR case. A “smarter” EDA tool should be able to handle this situation without changing on spec.’s reference flow. 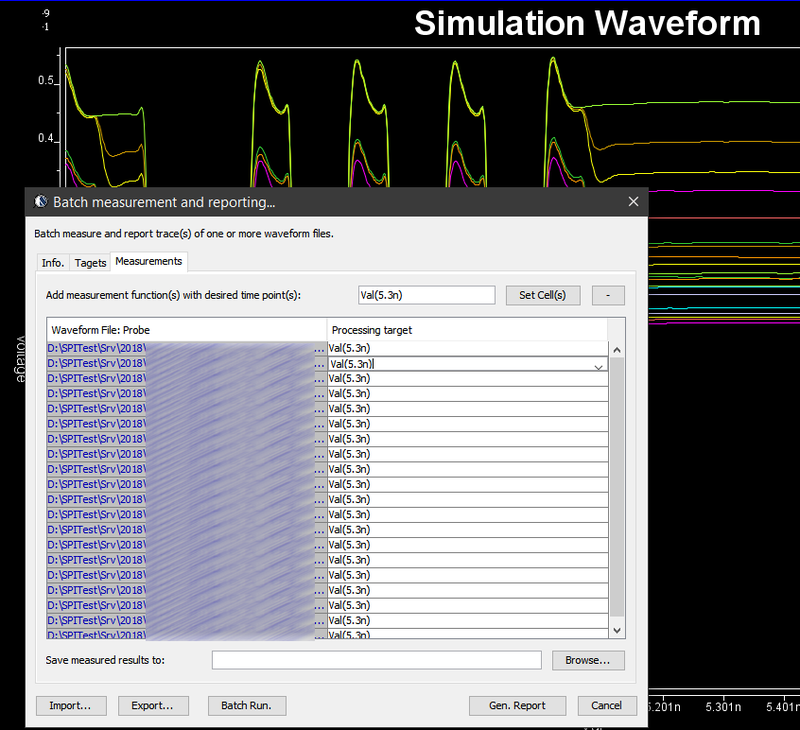 When a channel analysis is performed in a “statistical” flow, an EDA tool can obtain waveform data at both Tx and Rx analog buffer’s pads during calibration process. Such data can be used to construct a transform function, XForm(t). 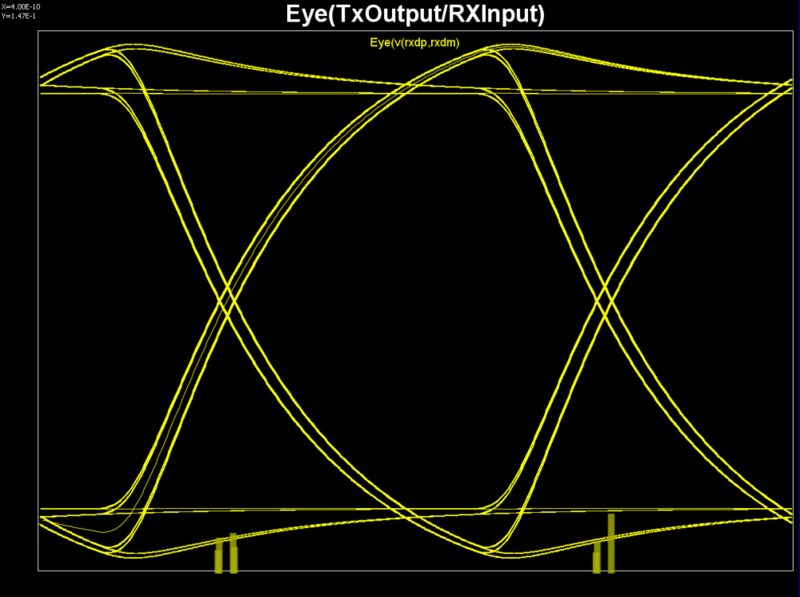 With this function, impulse response through EQ can be reconstructed and thus built an asymmetric eye. Tree structure may be needed to keep track of possible bit combinations. In a “bit-by-bit” flow, the current spec. may be too specific as it forces to use convolution of TX EQ’s output with channel’s impulse response before sending to RX EQ. Such direct convolution may be problematic. A “smarter” simulator may calculate it using different method without changing data output from TX EQ and input to the RX EQ. 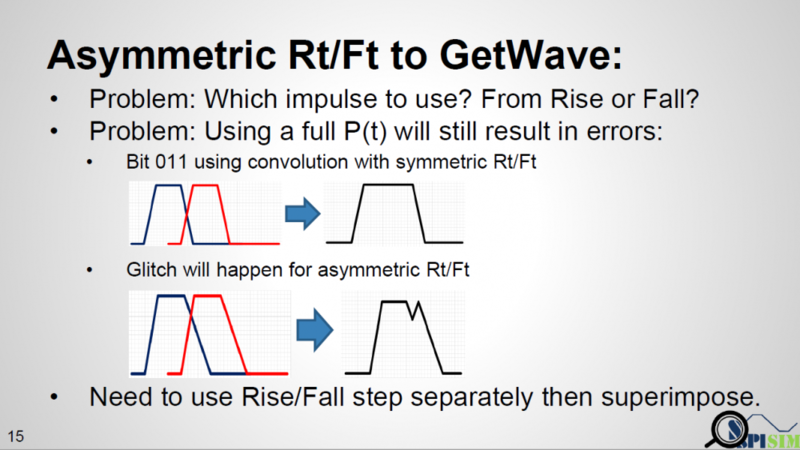 Step response should be used as different Rt/Ft will cause “glitches” when consecutive ones/zeros are present if convolution method is used. In previous post, I mentioned about the “IBIS cook-book” as a good reference for the analog portion of the buffer modeling. Unfortunately, when it comes to the equalization part, i.e. AMI, there is no similar counterpart AFAIK. For the AMI modeling, the EQ algorithms need to be realized with algorithms/procedures implemented as spec. compliant APIs and written in C language. These functions then need to be compiled as a dynamic library in either dynamic link libraries (.dll on windows) or “shared objects (.so on linux-like). Different compiler and build tool has different ways to create such files. So it’s fair to say that many of these aspects are actually in the computer science/programming domains which are outside the electrical or modeling scopes. It is unlikely to have a document to detail all these processes step-by-step. The following sections will describe each part in details. Believe it or not, the first step of AMI modeling is to create proper IBIS models… i.e. its analog portion. This is particular true if circuit being modeled belongs to TX. 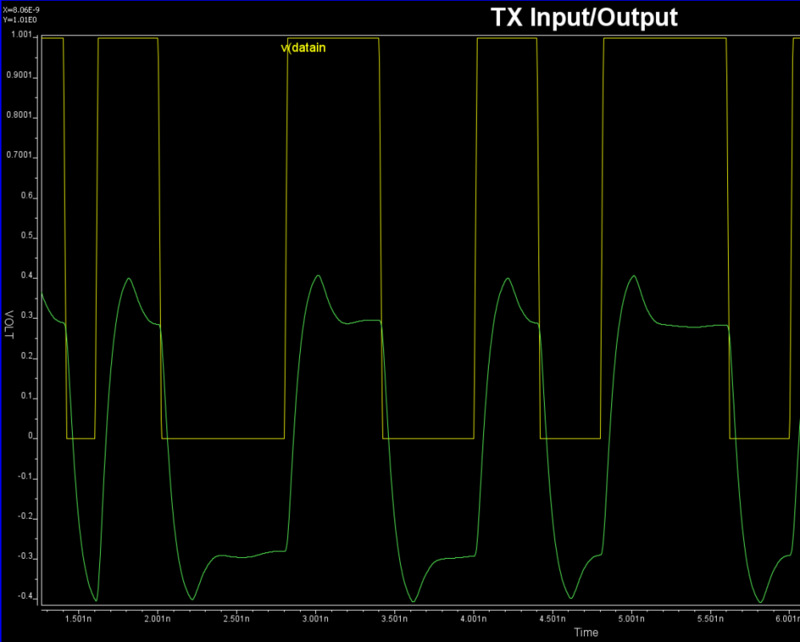 A TX AMI model is equalizing signals which includes its own analog buffer’s effect measured at the TX pad. So if there is no channel (pass-through) and it’s under nominal loading condition, the analog response of the TX will be the signals to be equalized. That is to say, without knowing what will be equalized (i.e. what the model’s analog behavior is), one can’t calculate the TX AMI model’s EQ parameters. Take the plot above as an example. This is a FFE EQ circuit. The flat lines indicated by two yellow arrows are different de-emphasis settings, thus controlled by AMI. However, the rising/falling slew rate, wave shape and dc levels etc as circled in red are all analog behaviors. Thus an accurate IBIS model must be created first to establish the base lines for equalization. Recently, BIRD 194 has been proposed to use touch-stone file in lieu of an IBIS model… still the analog model must be there. 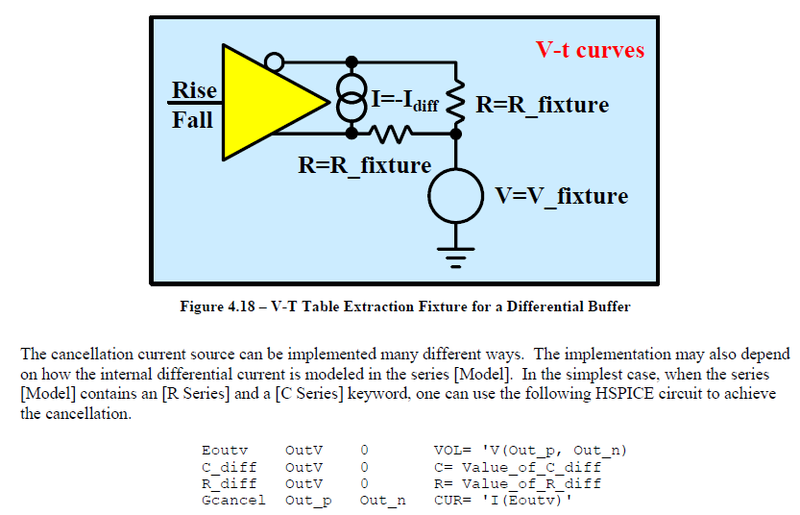 For a RX circuit, it may be easier as an input buffer is usually just a ESD clamp or terminator. Thus it doesn’t take much effort to create the IBIS model. Interested people may see my previous posts regarding various IBIS modeling topics. AMI’s data can be obtained from different sources: circuit simulation, lab/silicon measurement or data sheet. For simulation case, simulation must be done and the resulting waveform’s performance needs to be extracted. These values will serve as a “design targets” based on whitch AMI model’s parameters are being tuned. Some of the circuits may have response is in frequency domain. In this case, various points (DC, fundamental freq. 2X fundamental etc) needs to be measured like above. If it’s from data sheet, then the values are already there yet there may be different ways to realize such performance. For example, equations of different zeros and poles locations may all have same DC gain or gain at particular frequencies, so which one to pick may depending on other factors. Once architecture is defined, next step is the actual C/C++ implementation. This is where programming part starts. Ideally, building blocks from previous projects are there already or will be created as a module so that they can be reused in the future. Multiple instance of the same models may be loaded together in some cases so the usage of “static” variables or function need to be very careful. Good programming practice comes into play here. I have seen models only work with certain bit-rate and 32 samples per UI. That indicates the model is “hard-coded”… it does not have codes to up-sample or down-sample the data based on the sampling-interval passed in from the API function. Accompanied with writing model’s C codes are unit testing, source revision control, compilations and dependencies check etc. The last one is particular important on linux as if your model relies on some external libraries and it is not linked statically, the same model running fine on developer’s machine will not even pass golden checker at user’s end…. because the library is not available there. Typically one will need to prepare several machines, virtual or not, which are “fresh” from OS installation and are the oldest “distros” one is willing to support. All these are typical software development process being applied toward this AMI modeling scope. After the binary .dll/.so files are generated, then next step is to assemble a proper .ami files. Depending on parameter types (integer, values, corners etc), different flavors of syntax are available to create such file. 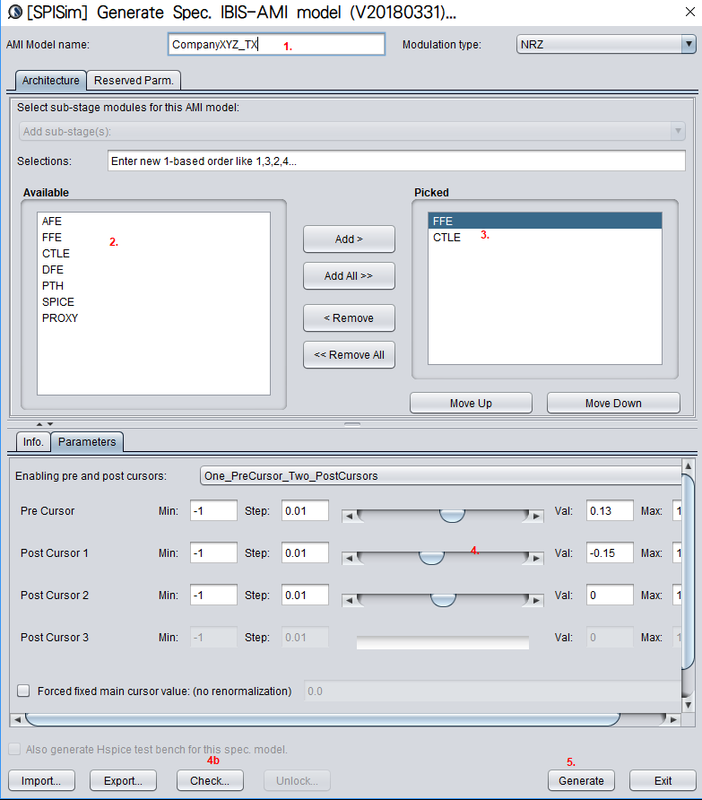 In addition, different EDA simulators has different ways to present the parameter selections to its end user. So one may need to choose best syntax so that choices of parameter values will always be selected properly in targeted simulators. For example, if one already select TYP/MIN/MAX corner for the IBIS model, he/she should not have to do so again for the AMI part. It doesn’t make sense at all if a MIN AMI model will be used with MAX corner IBIS model… the corner should be “synchronized”. Basically, our tool let user specify matching target and tool will use bisection algorithm to find the tap values. Hundred of cases can be “tuned” in a matter of minutes. In some other cases, grid search may be needed. 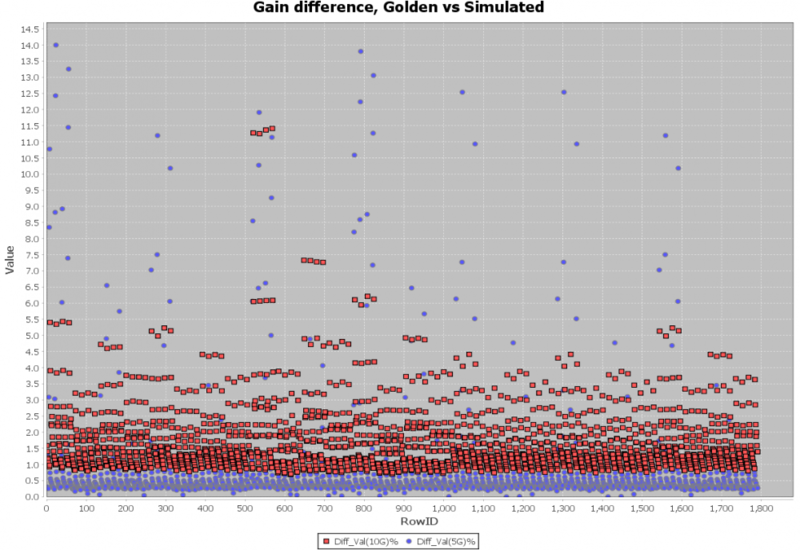 The golden checker didn’t start checking the included AMI binary models until quite recently. Basically it loads the .ibs file, identifies models with AMI functions, then check the .ami file syntax. Finally, the checker will load the associated .dll/.so files. Due to the fact that different OS platform loads binary files differently, that means certain models (e.g. .dll) can only be checked on associated platform (e.g. Windows). That’s why one needs to perform the same check on different platforms to make sure they are all successful. Library dependencies or platform issues can be identified quickly here. However, the golden checker will not drive the binary file. So the functional checks described in next paragraph will be next step. Here, pattern like %VARIABLE_NAME% is used to create a .ami template. 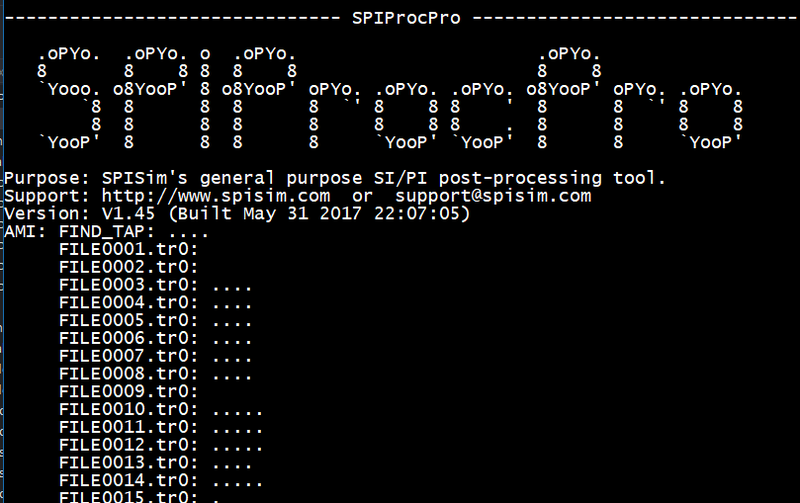 Then our SPIMPro can be used to generate all combinations of possible parameter values and create as a table. There can usually be hundreds or even thousands cases. Similar to the process described in “Systematic approach mentioned in my previous post”, we can then generate corresponding .ami files for all these cases. So there will be hundreds or thousands of them! Next step is to be able to “drive” them and obtain single model’s performance. Depending on the EDA tools, most of them either do not have automation capability to do this in batch mode or may require further programming. In our case, our SPIMPro and SPIVPro have built-in functions to support this sweeping flow in batch mode all in the same environment. SPISimAMI model driver is used extensively here! Once each case’s simulation is done, again one needs to extract the performance then compare with those obtained from raw data and make delta comparison. A scattering plot like below will quickly indicate which AMI parameter combinations may not work properly in newly created AMI models. In this case, one needs to go back to the modeling stage to check the codes then do this sweep validation all over again. Another required step here is to test with different EDA vendor’s tool. This presents another challenge because channel simulator is usually pricey and it’s rarely the case that one company will have all of them (e.g. ADS, HyperLynx, SystemSI, QCD and HSpice etc). 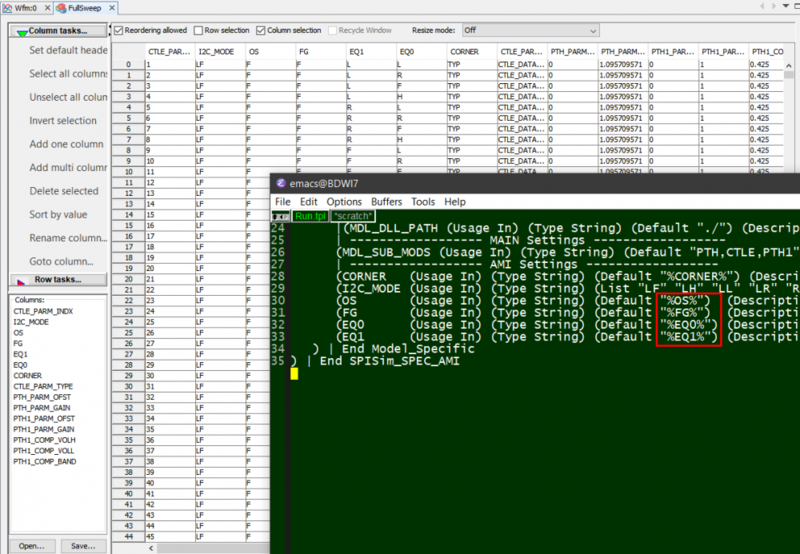 Different EDA tools does invoke AMI models differently… for example, some simulator passes absolute path for DLL_Path reserved parameter while others only sent relative path. So without going through this step, it’s difficult to predict what a model will behave on different tools. Once all these are done, the final step is of course to create an AMI model usage guide together with some sample set-ups. Usually it will starts with IBIS model’s pin model associations and some performance chart, followed by descriptions of different AMI parameters’ meaning and mapping to the data sheet. One may also add extra info. 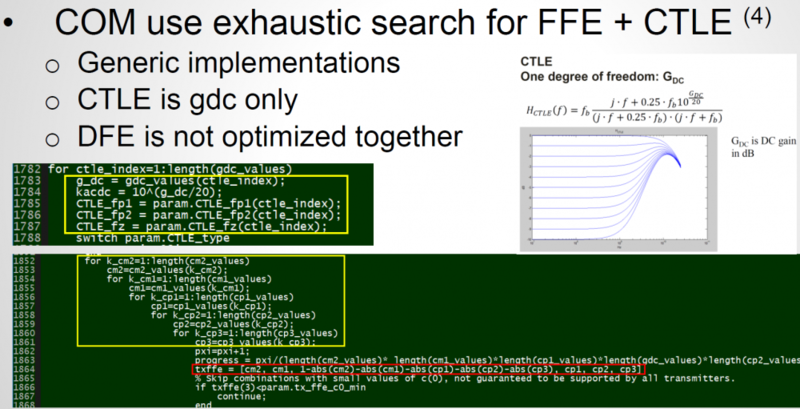 such as alternatives if the user’s EDA tool does not support newer keyword such as Dll_Path, Dll_ID or Supporting_Files etc. 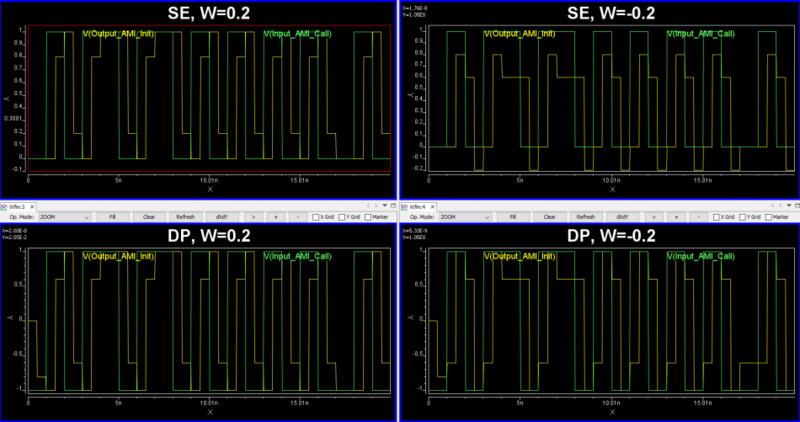 Waveform comparison between original data (silicon measurement vs AMI results) should also be included. Finally it will be beneficial to provide instructions on how an example channel using this model can be set-up in popular EDA tools such as ADS, HyperLynx or HSpice. There you have it.. the end-to-end AMI modeling process without touching programming details! Both AMI API and programming languages are moving targets as they both evolve with time. Thus one must continue honing skills and techniques involved to be able to deliver good quality models efficiently and quickly. This is a task which requires disciplines and experience of different domains. After sharing these with you readers, do you still want to do it yourself? 🙂 Happy modeling! For engineers who are new to IBIS modeling, the “IBIS CookBook” [LINK HERE] is a very good reference document to get started. The latest version, V4.0, was created back in 2005. While most of the documented extraction procedures still hold true to this date, some of them may be tedious or even ambiguous in terms of executions. This is particular true for processes mentioned in Chapter 4, differential buffer modeling. Further more, most recent IBIS summit presentations focus on “new and hot” topics like IBIS-AMI modeling methodologies and not many are for the traditional IBIS. 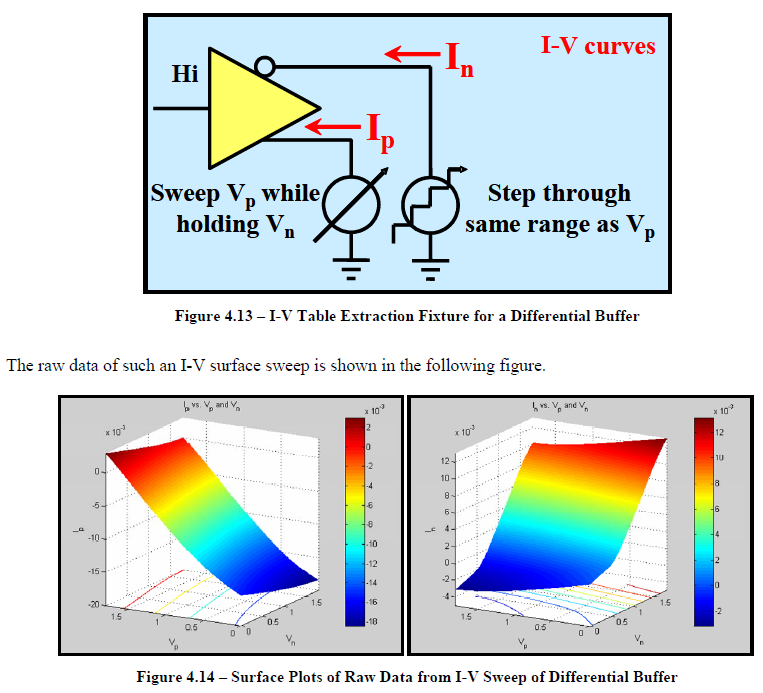 In this post, I would like to first review these “formal” process, dive into how each modeling table is extracted and used in simulation, then propose a “quick and easy” method particular for differential buffer. I will then summarize with and this approach’s pros and cons. The most basic IBIS building block, as defined in Spec. Version 3.2, is shown above. Typically at least six tables will be included in an output type buffer. They are IV (Pull-up, Pull-down) and Vt( Rising and falling) under two different test load conditions. Additional clamp IV table (Power and Ground clamp) may be added for input type buffer. 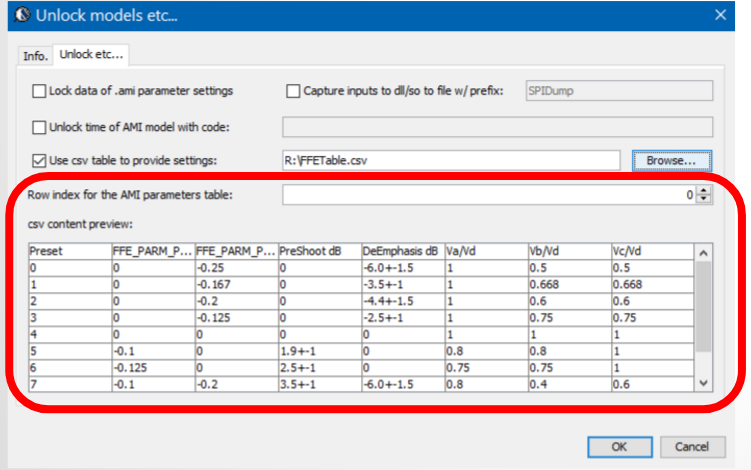 After Spec version V5.1, Six additional IT tables for ISSO_PU/PD/Composite currents have also been added to address PDN effects. To create an IBIS model, the data extraction processes start with exciting particular portion of the buffer so that measured data can be post-processed to formulate as a spec-compatible table format. Because a model also has TYP/MIN/MAX skews, so the number of simulations are basically the aforementioned number of tables times three. That is, for a most basic IBIS modeling, one may need to simulate at least eighteen cases (or simulation “decks”). Package/Pin parasitics: IBIS cookbook and normal modeling flow do not mention about this part. Usually a buffer package’s model is extracted using tools such as HFSS or Q3d into a form of S-parameters or equivalent broad-band spice model. An IBIS model can use a lumped R+L+C structure to describe pin specific or package (apply to all pins) specific parasitics. Alternatively, an IBIS model can also use a more detailed tree structure package model shown below for non-lumped structure. Regardless, it’s HFSS or Q3D’s task to convert such extracted S-parameter or multi-terminal sub-circuit into these simple lumped RLC values or tree structures to be included in an IBIS file. It’s a separated process and not discussed here as a part of the buffer modeling. C_Comp: At the very beginning, there is only a C_Comp value between pad and ground and it is used to describe frequency dependent behavior besides the parasitics. Later on, tool like HSpice introduces extra simulation syntax to split this single C_Comp value into branches between pad and various power terminals for better accuracy. Even later, this type of syntax was adopted as part of the IBIS spec. Still, user may only find how a single C_Comp value is computed in most materials. Briefly speaking, they can be calculated using time-domain method based on RC charging/discharging time constant or freq-domain method based on the imaginary current at a particular frequency. How to split this single value into several ones to match the frequency plot best remains an art (i.e. not standardize). In addition, the value C_Comp is not visible during modeling… their effects are only shown when there are reflections back from the other end due to impedance mismatch. What we have found is that usually an IC designer has a better idea about how this value should be and the aforementioned time/frequency domain calculation method may not produce an accurate estimate. Clamp current: Power/Ground clamp currents and Pull-up/Pull-down currents are both IV based (i.e. dc steady state). So they are combined for load-line analysis during simulation. The difference between Pull-up/Pull-down and Clamp is that the latter one (i.e. Clamp) can’t be turned-off. So its effect is always there even when we are extracting IV for Pull-up/Pull-down structures. Thus to avoid “double-counting”, the post-processing stage needs to remove the clamp current from pull-up/pull-down currents first before putting them into separated table. To simplify the situation… particular for an output differential buffer, we may just use IV data even though this is an IO buffer. 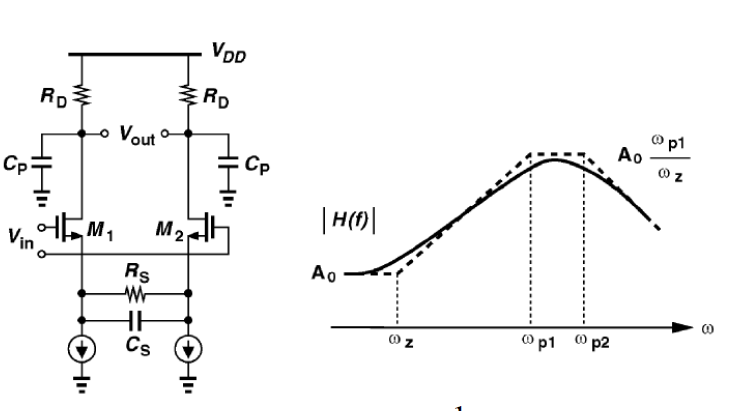 IT current: These are different dc or transient based sweep in order to obtain buffer’s drawing current when power or ground are not “ideal”. This is important in DDR case when the DQ is single ended and it’s subjective to PDN’s noise. For differential application like SERDES, PDN’s effects are usually present at both the P and N terminals and will cancel with each other. Thus their extraction may be skipped for a differential buffer mostly. One may also note that the IT extraction of composite current is “synchronized” with VT extraction of rising/falling waveform so these current data are extracted with additional “probes” rather than separated simulation. 0, Collect design data and collateral: A modeler needs to gather PVT (process, voltage, temperature) data, silicon design, buffer terminals’ definitions and bias conditions etc. A buffer may have several tuning “legs” and bit-set settings so a modeler needs to determine which will be used for TYP, MIN and MAX corners. 1, Prepare working space: Create a working space on the disk. 2, Generate simulation inputs: Generate simulation “decks” to excite different block of the buffer…one at a time. So one will have eighteen or more decks at the end of this stage waiting to be simulated. 3, Perform simulations: Perform simulation either sequentially on a local machine or with a simulation “farm”. Double check the results and make sure they make sense, otherwise, go back to step 0 to see which settings may be incorrect or missing. 4, Generate IBIS model: Post-process the simulation data and generate IBIS model. This is usually done by the tool like ours as manual process is tedious and error prone. 5, Syntax check: First quality check of an IBIS model is that it must pass the golden checker. The check here is mostly syntax-wise though there are also basic behavior check such as monotonicity or DC mismatch etc. 6, Validate IBIS model: A formal validation for an IBIS model is to hook-up test load and make sure they produce correlated results comparing to those from silicon at the end of step 3 above. 7, Performance report: The modeler needs to extract the performance such as PU/PD impedance values and slew rate etc. for documentation purpose and check against the spec. or data sheet. 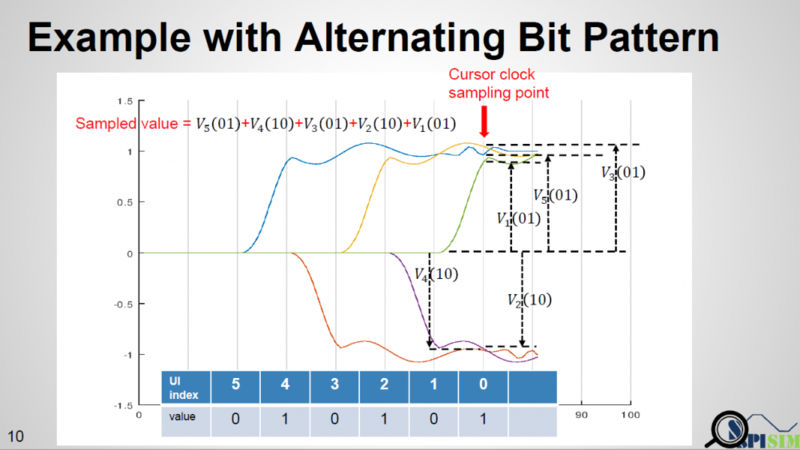 There are also some complications regarding the DC simulation part: some of the buffer may have “clocking” and it’s not easy to separate them from the buffer iteself. Also, there may be many RC parasitics between nodes for a buffer netlist extracted from post-layout. In other cases one can’t even separate the actual IO part from the pre-driving portions and the resulting circuits to be simulated become huge and time consuming. These situations will make IV data extraction slow and often problematic. As a result, a simple step 0~7 modeling process may not work properly and one need to iterate to tune the set-up such that simulation will always converge and resulting IV curve be monotonic. Nevertheless, the single buffer’s modeling is easier to manage. Differential buffer’s IBIS modeling extends the challenge and effort to another dimension…literally! First of all, each pin in an IBIS file or component connect to an IBIS model and the possible structures and connections between different pins are very limited. So for a differential buffer, a series element needs to be created to describe the coupling relations between pins. All the pictures used in this paragraph are from IBIS cookbook and user may find further descriptions there. In order to construct such series model, the IV sweep needs to be performed in two dimensions, both at similar resolutions. So if say a typical single-ended IV curve has one hundred points, then the second dimension should also have that much data. That means for one particular corner, there will be one hundred IV simulation in order to construct the 2D response surface shown below. First stage post-processing also needs to be preformed so that common-mode current can be eliminated. All these need to be done before formulating a 2D data view. Only after one can visualize the resulting data, he or she can determine what components are needed to create such series model. This presents the first challenges on top of the IV simulation issues mentioned for single-ended buffer. The second challenge is regarding the VT simulation. The current flow through this newly constructed series element needs to be “eliminated” to avoid being double counted. For spice-like simulator, there is no such thing as “negative resistance”, “negative capacitance” etc. So one has to resort to approaches like control elements or even Verilog-A (as we presented in IBIS Summit 2016) to have proper VT data extracted. For control-source based approach, it is only limited describe pin couplings of a simple R/C but not non-linear resistance or surface such as series mosfet. For that, an intermediate step to map device or equation parameters to the calculated 2d surface is needed. Even using Verilog-A’s look-up table, the grid resolution is limited by the step size used in first two-dimensional IV step and may have non-convergence issue if it’s to coarse. That’s why in the cook book (the first two lines in the picture below), it doesn’t suggest any approach as it’s really not that easy! Due to these two great challenges, we have found that differential modeling may not be easy for most modeler. We feel more this way when providing modeling service to clients who wants to perform simulations themselves then send us data. They may want to do so due to IP concern or they knowing more about the design. In those cases, the back-and-forth tuning and tweaking process become a burden on their side and also delay the whole schedule. Thus we are motivated to find an alternative “quick-and-easy” approach to substitute the “formal” modeling steps mentioned above. While being able to simulate accurately w/ great performance is still number one priority, we are ok that they can only be used under some context (such as channel simulation). 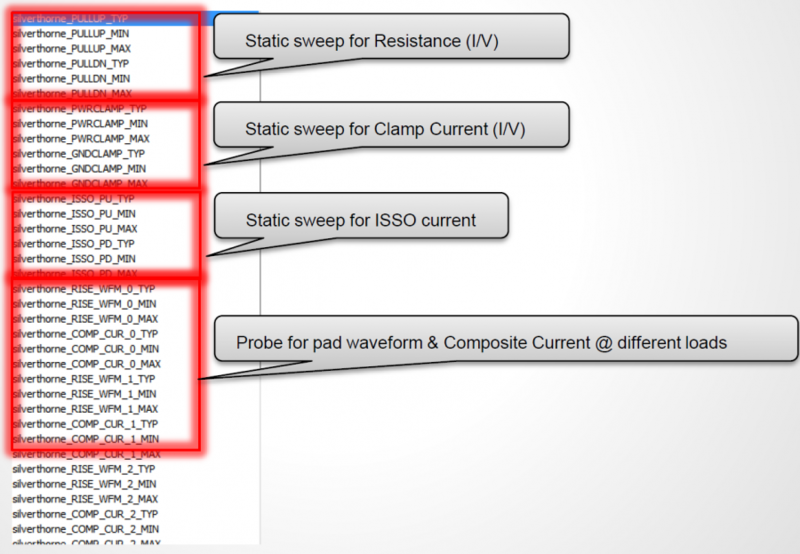 In previous post, we explained how IBIS model’s data are used in a circuit simulation. Simply speaking, the “VT” data is considered as “target” while “IV” tables are used to compute so called “switching coefficients” so that appropriate amount of current will be injected or withdrawn from the buffer pad to achieve. When this is true, the nodal voltage specified by that VT table at that particular time point will be satisfied due to KCL/KVL. Now there are switching coefficients for both pull-up and pull-down structures… thus it takes two equations to solve these two unknowns. That’s why two set of VT, each under different test loads, are required. Based on this algorithm, an IV data and calculated coefficients are actually “coupled” and affect each other. If current in IV table is larger, than the calculated coefficients will become smaller and vice versa. This way the overall injected/withdrawn current will still meet KCL/KVL required for VT. In this sense, the actual IV data is not that important as it will always be “adjusted” or “weighted” by the parameters. On the other hand, the VT data also contains several DC points and they need to be correlate to the IV table, otherwise DC mismatch errors will be thrown by the golden checker. In addition, the IV data is limited to 100 points and they need to be monotonic to avoid convergence issue. So if we have several sets of VT data and one under normal test load (say 100 ohms for a differential buffer), then they will give us “hints” regarding how IV data will look like. 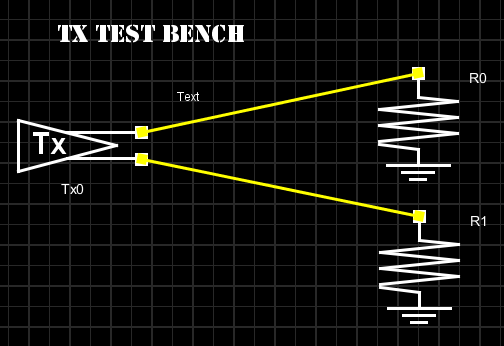 The main goals is to have two set or set-up covering operating range when a nominal test load (say 100 ohms) is used. Obtain voltage range, temperature etc parameters. And that’s all, through carefully implemented algorithm and computation, we can generate an IBIS model based on these data with minimal simulation requirements. An the generated model is guaranteed to be error/warning free. While we will not disclose how these are actually done in details, we can show how they are incorporated in our SPIBPro… as shown below. As a matter of fact, this process has been used in the modeling projects of past year and shown great success. Will be mathematically correct: no DC mismatch or monotonic warnings, output will match provided VT waveform under nominal test load. No Power-aware consideration as ISSO_PU/ISSO_PD generation are not taken into account. In this blog post, we reviewed the formal IBIS modeling process described in the cook book, challenges modelers will face and proposed an alternative “quick-and-easy” approach to address these issues. The proposed flow uses minimum simulation data while maintaining great accuracy. There might be limitations on models generated this way such as neither disable state nor power-aware data are accounted. However, in the context of channel analysis particular when a differential model is used together with its IBIS-AMI model, we have found great success with this flow. We have also incorporated this algorithm to our SPIBPro so our tool users can benefit from this efficient yet effective flow. Continuous time linear equalizer, or CTLE for short, is a commonly used in modern communication channel. In a system where lossy channels are present, a CTLE can often recover signal quality for receiver or down stream continuous signaling. There have been many articles online discussing how a CTLE works theoretically. More thorough technical details are certainly also available in college/graduate level communication/IC design text book. In this blog post, I would like to focus more on its IBIS-AMI modeling aspect from a practical point of view. While not all secret sauce will be revealed here:-), hopefully the points mentioned here will give reader a good staring point in implementing or determining their CTLE/AMI modeling methodologies. The picture above shows two common SERDES channel setups. While the one at the top has a direct connection between Tx and Rx, the bottom one has a “repeater” to cascade up stream and down stream channels together. This “cascading” can be repeated more than once so there maybe more than two channels involved. CTLE may sit inside the Rx of both set-ups or the middle “ReDriver” in the bottom one. In either case, the S-parameter block represents a generalized channel. It may contain passive elements such as package, transmission lines, vias or connectors etc. 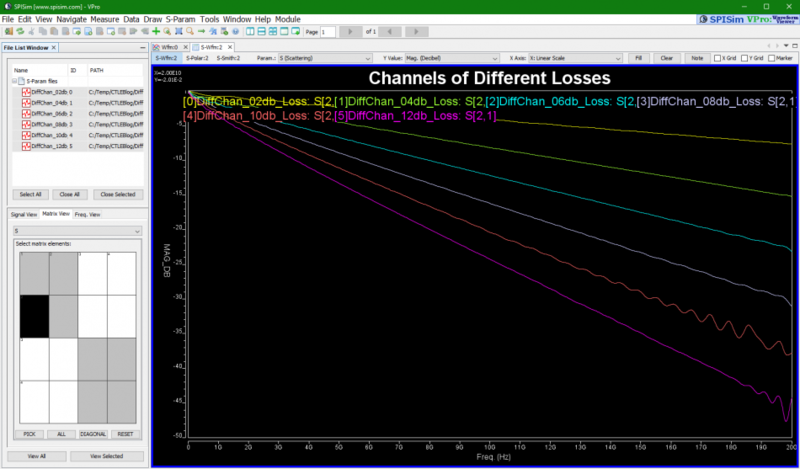 A characteristic of such channel is that it presents different losses across spectrum, i.e. dispersion. For example, if we plot these channel’s differential input to differential output, we may see their frequency domain (FD) loss as shown above. In reality, such all pass filter does come often. In order to compensate our lossy channels (as indicated by the red box) to be more like the ideal case (green box) as an end result, we need to apply equalization (indicated by blue box). This is why an equalizer is often used… basically it provides a transfer function/frequency response to compensate the lossy channel in order to recover the signal quality. A point worth taken here is that the blue box and red box are “tie” together. So using same equalizer for channels of different losses may cause under or over compensated. That is, an equalizer is related to the channel being compensated. Another point is that CTLE is just a subset of such linear equalizer. Now that IBIS-AMI modeling for CTLE is of concern, how do we obtain such modeling data for CTLE and how they should be modeled? 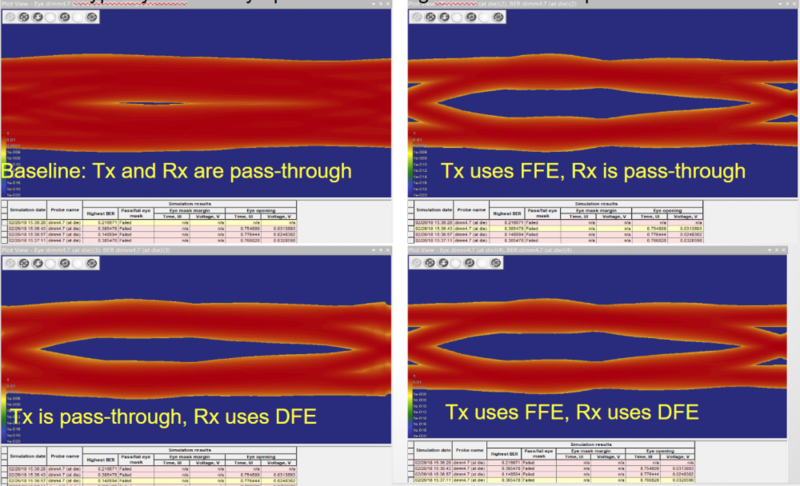 Depending on the availability of original EQ design, there are several possibilities for FD data: Synthesized with poles and zeros, extract from S-parameters or AC simulation to extract response. Poles and Zeros: Given different number of poles, zeros and their locations along with dc boost level, one can synthesize FD response curves: So say if we are given a data sheet which has EQ level of some key frequencies like below: Then one can sweep different number and locations of poles and zeros to obtain matching curves to meet the spec. : Such synthesized curves are well behaved in terms of passivity and causality etc, and can be extended to covered desired frequency bandwidth. Extract from S-parameters: Another way to obtain frequency response is from EQ circuit’s existing S-parameter. This will provide best correlation scenarios for generated AMI model because the raw data can serve as a design target. However, there are many intermediate steps one have to perform first. For example, the given s-parameter may be single ended and only with limited frequency range (due to limitation of VNA being used), so if tool like our SPISim’s SPro is used, then one needs to: reording port (from Even-Odd ordering, i.e. 1-3, 2-4 etc to Sequential ordering, i.e. 1, 2 -> 3, 4), then convert to differential/mixed mode, after that extrapolate toward dc and high frequencies (many algorithms can be used and such extrapolation must also abide by physics) and finally extract the only related differential input -> differential output portion data. AC simulation: This assumes original design is available for AC simulation. Such raw data still needs to be sanity checked in terms of loss and phase change. For example, if gain are not flat toward DC and high-frequency range, then extra fixing may be needed otherwise iFFT results will be spurious. 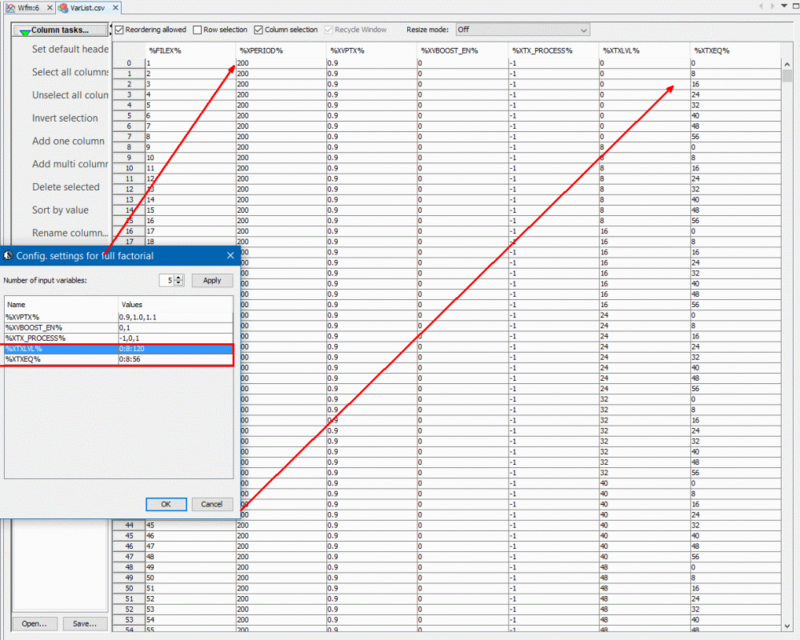 How to do iFFT: padding with zeros or conjugate are usually needed for real data iFFT. If the original FD data is not “clean” in terms of causality, passivity or asymptotic behavior, then they need to be fixed first. TD simulation: Is simulating impulse response possible? If not, maybe a step response should be performed instead. Then what is the time step or ramp speed to excite input stimuli? Note that during IBIS-AMI’s link analysis, the time step being used there may be different from the one being used here, so how will you scale the data accordingly. Once a step response is available, successive differentiation will produce impulse response with proper scaling. Now that we have data to model, how will they be implemented in C/C++ codes to support AMI API for link analysis is another level of consideration. Decision mechanism: As mentioned previously, a CTLE FD response targets at a channel of certain loss, thus the decision to use appropriate CTLE settings based on that particular channel at hand must either be decided by user or the model itself. While the former (user decision) does not need further explanation, the latter case (model decision, i.e. being adaptive) is a whole different topic and often vendor specific. 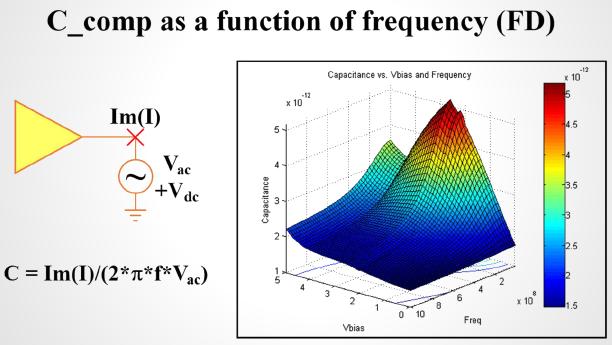 Typically, such adaptive mechanism has a pre-sorted CTLE in terms of strength or EQ level, then a figure-of-merit (FOM) needs to be extracted from equalized signal. That is, apply a tentative CTLE to the received data, then calculate such FOM. 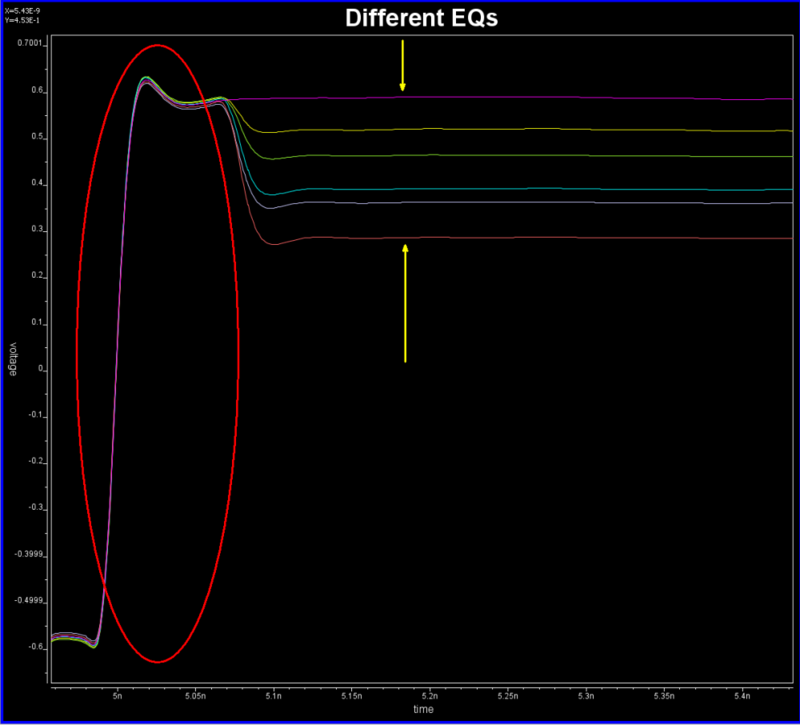 Then increase or decrease the EQ level by using adjacent CTLE curves and see whether FOM improves. Continue doing so until either selected CTLE “ID” settles or reach the range bounds. This process may be performed across many different cycles until it “stabilized” or being “locked”. Thus, the model may need to go through training period first to determine best CTLE being used during subsequent link analysis. This is now more in software architecture domain and needs some trade-off considerations. 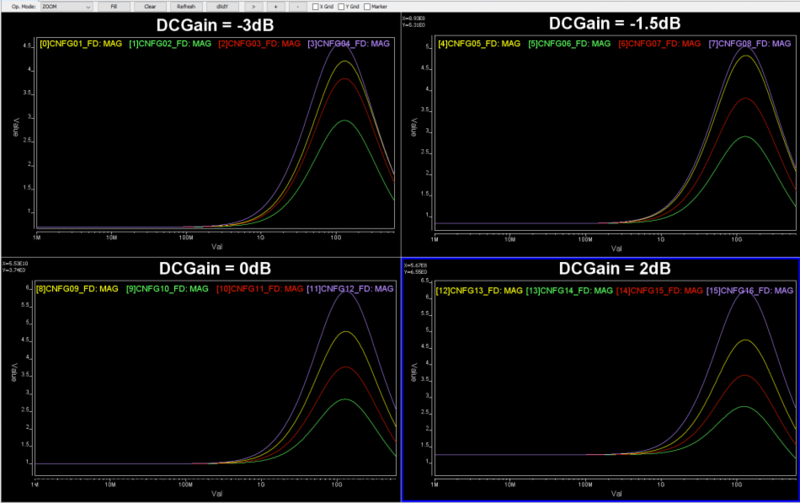 For example, you may want to provide fine grid full spectrum FD/TD response but the data will may become to big. So internal re-sampling may be needed. 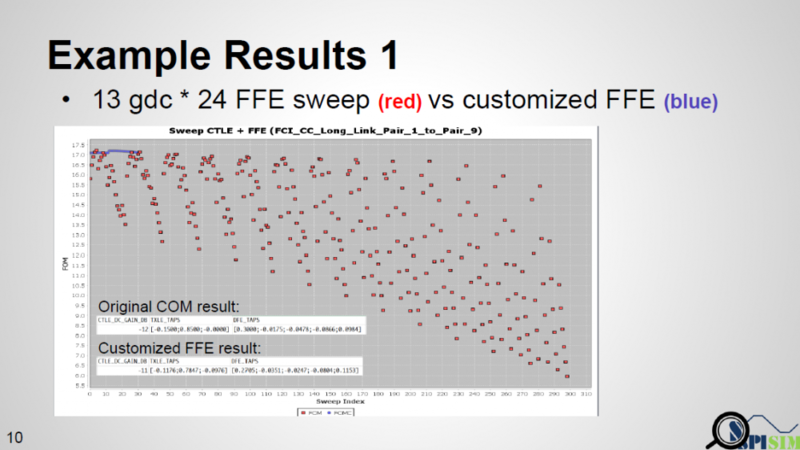 For FD data, the model may needs to sample to have 2^N points for efficient iFFT. Different corner/parameter selection should not be hard coded in the models because future revised model’s parameter may be different. For external source data, encryption is usually needed to protect the modeling IP. With proper planning, one may reuse same CLTE module in many different design without customization on a case-by-case basis. However, getting results like this in the first try may be a wishful thinking. In particular, the IBIS-AMI model does not work alone… it needs to work together with associated IBIS model (analog front-end) in most link simulator. So that IBIS model’s parasitics and loading etc will all affect the result. Besides, the high-impedance assumption of the AMI model also means proper termination matching is needed before one can drop them in for direct replacement of existing EQ circuit or behavioral models for correlation. 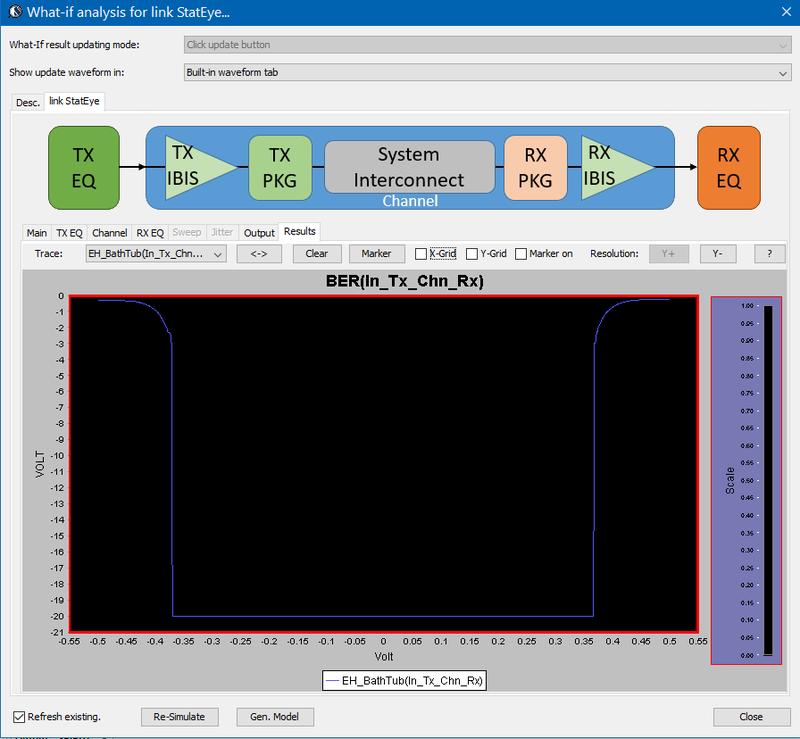 We SPISim recently developed and released free web apps for various channel analysis tasks [Click HERE for overview]. While their product page each gives good descriptions and demo about what each tool can do individually, we think it will also be beneficial to put them all together in one flow so that user may have better picture about our ideas behind these developments. Thus this post is written for dual purposes: First we would like to explain how a channel analysis is usually performed. Secondly we want to show how one can perform such process using apps even directly from the web browser. Just for comparison, creating AMI models and license for this type of simulator usually costs tens of thousands of dollars up front. Now it can be done for free! Let’s use a SERDES system, shown in Fig. 1 above, as an example. For other interface’s such as DDR, please see our previous blog post for considerations about similar application. A SERDES system uses a point-to-point topology. In Fig. 1, the middle block enclosed in blue represents the channel. It mainly contains passive interconnect such as package, transmission line, vias, connectors or even cable. However, the channel may also include active components such as Tx and Rx devices. These active components are usually represented by IBIS or spice models. Alternatively, we can pull these active components out from the channel and “merge” them into the EQ as “analog front end” stages. In that case, the channel become pure passive. One of the reasons why one may want to do it this way may be either that the IBIS models are not be ready, or there are no simulators available to have them included as part of the simulation. This is usually the case when a free spice simulator is used as none of them that I am aware of supports IBIS out of the box. In general, unless analog front end AMI models and a pure passive channel, represented as a S-parameter, are used together for the analysis, the active devices do need to be part of the channel characterization in order to obtain accurate time domain response. 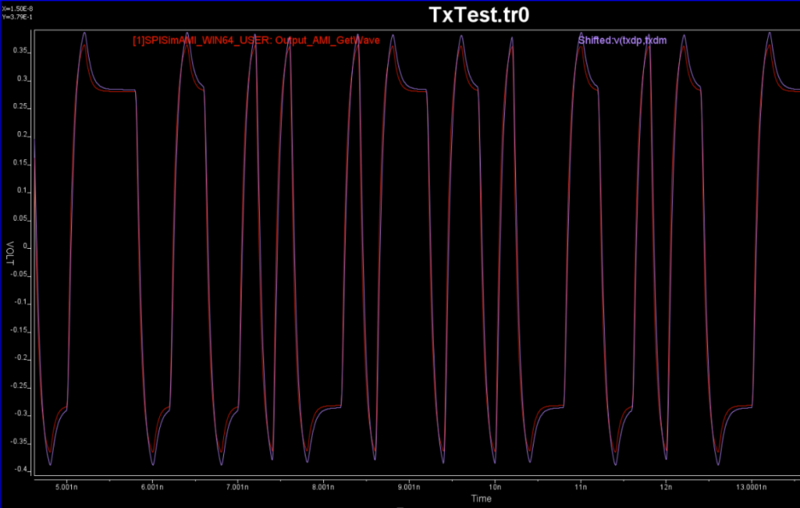 The next step is to obtain or generate AMI models for each Tx and Rx EQ circuits. Interested reader may refer to several posts we have written about possible software architecture and methodologies. 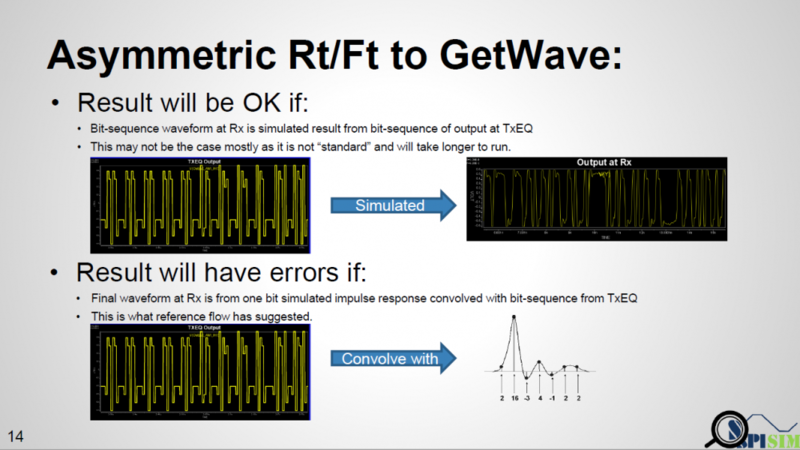 Regarding the channel analysis process, a simulator will first convert the characterized channel in s-param, or step response into impulse response first, then depending on the simulation mode being specified, this response or convoluted bit sequence will be fed into Tx and Rx respectively to obtain the overall response. For LTI system, a permutation process will be performed for all possible bit combinations to calculate the PDF of each sampling point statistically, then integrate to obtain the CDF and thus create a bath tub plot. For a NLTV system, bit-by-bit waveform is accumulated and overlapped to plot the eye and BER may be extrapolated from there. While not mentioned here and also not yet implemented, various jitter and noise components are also important when creating the stimulus or calculating final results. 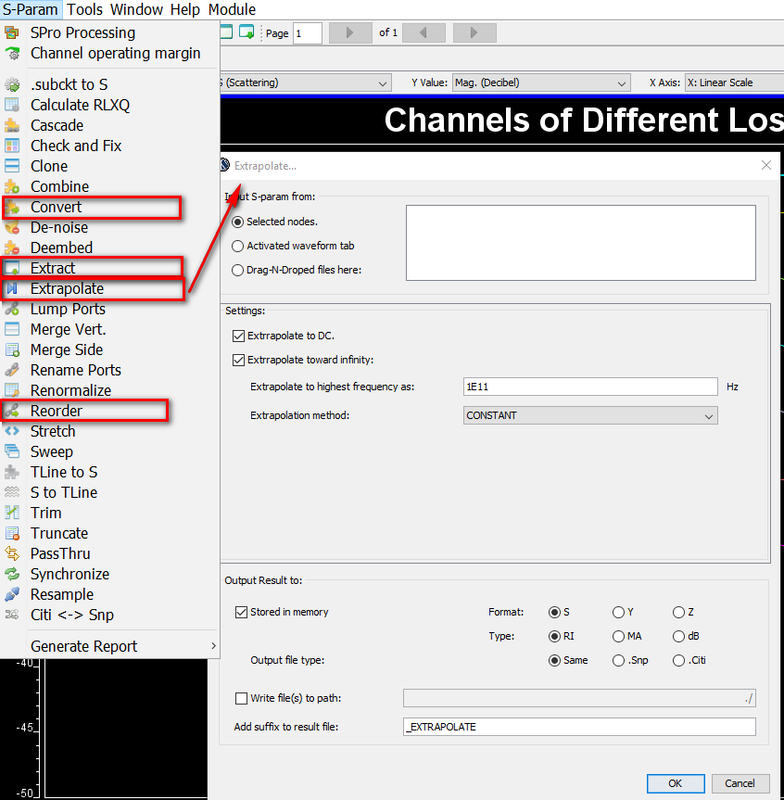 Following the analysis procedure detailed on Section 10.2 of IBIS spec, to summarize them briefly, a channel analysis includes three tasks: channel characterization, EQ model creation and putting them all together for channel simulation. The first step of channel analysis is to characterize the channel, the blue block of Fig. 1, in order to obtain is time domain response. Even with active Tx/Rx front end being involved, the assumption here is that the characterized response will be linear time invariant (LTI). With a LTI input, a channel simulator can either perform statistical analysis if other EQ components are also LTI, or it can have the impulse convolved with PRBS bit sequence to generate full time domain waveform, finally procees to process with NLTV EQ components to get the final time domain waveform for further eye analysis. 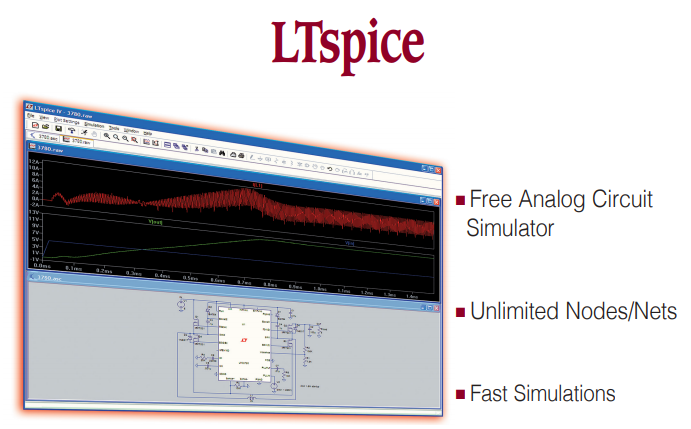 Then head over to LTSpice, offered by Analog device, to download and install the free simulator. 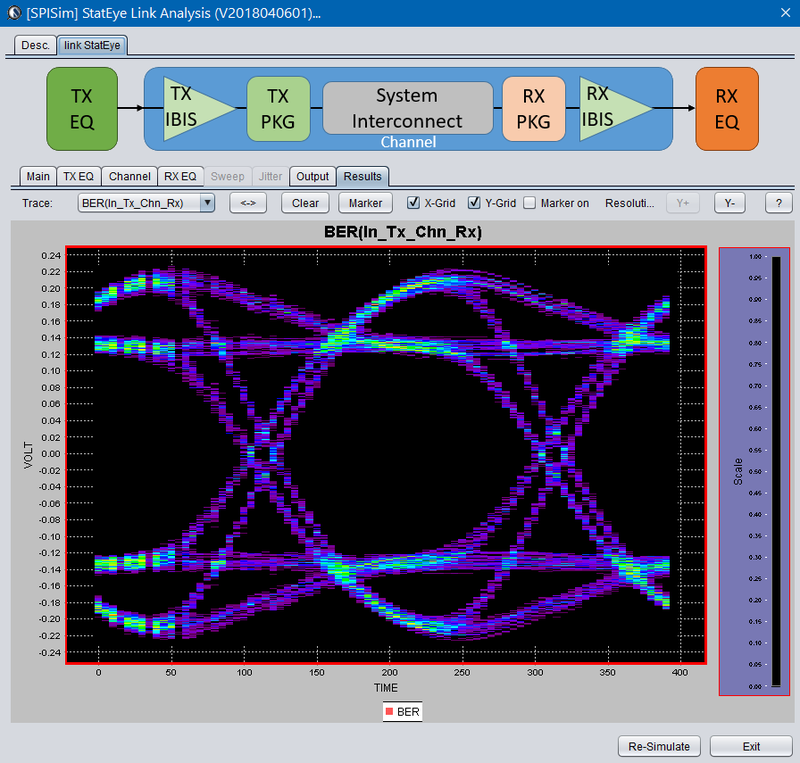 If no EQ circuit is involved, then user can simply tinker the circuit/simulation settings completed in task 1 to perform conventional time domain based SI analysis. The reason stat-eye like channel analysis comes to play is because EQ circuits (represented in green block for Tx EQ and orange block for Rx EQ in Fig. 1) are involved to open the eyes and many more bits need to be “simulated” to obtain/extrapolate low BER, thus can’t be done easily using nodal based spice simulator as it will simply take too much time. EQ circuits can come in different models such as behavioral, spice or AMI, with AMI being the common denominator supported by almost all channel analysis tools from different vendors. Thus in the second task, we need to generate IBIS-AMI models for Tx and Rx EQ. Then click “Generate” button and the AMI model will be generated instantly. If cross platform models are desired, use [SPILite] instead and all Windows 64, Windows 32 and Linux 64 models will be generated in one shot. At the beginning of this section, we mentioned that the EQ model can also be in the form of spice circuit, whether encrypted or not. In that case, its detailed behaviors will not be able to be described exactly by template based or pre-defined models. 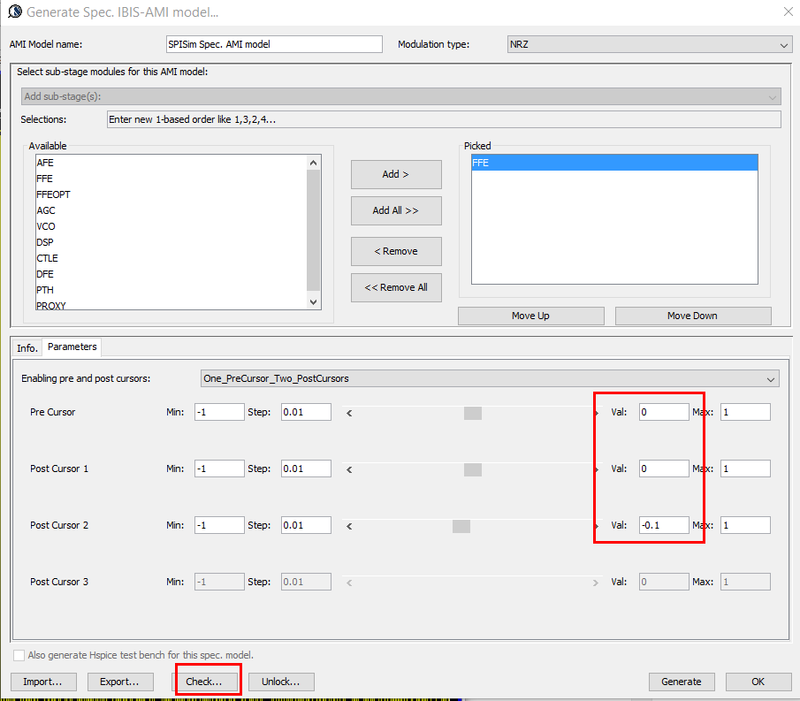 However, a spice wrapper AMI model supported by SPILite can still be used, it will make this spice model “AMI compatible” and can be used in other channel simulators. User’s licensed/installed simulator will be called during the channel simulator. 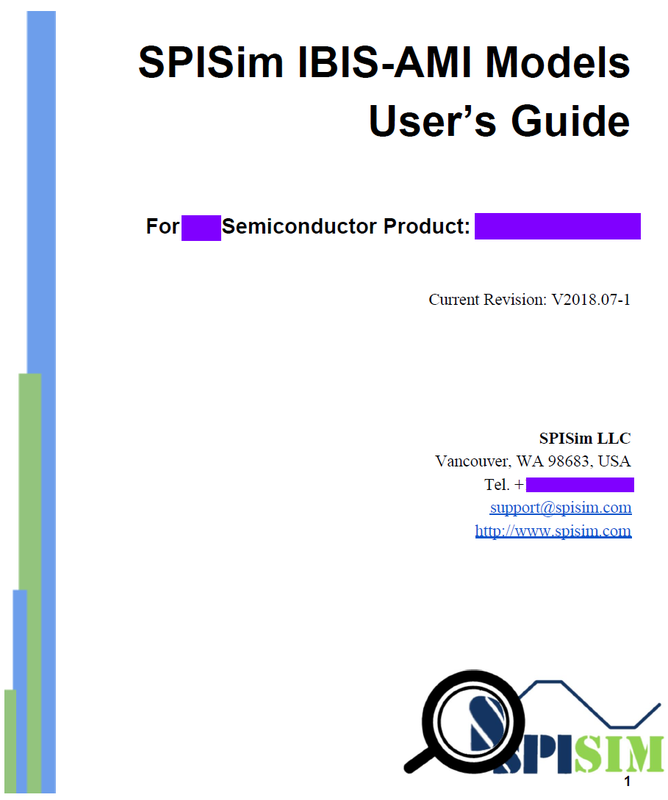 For a system developer, he/she may obtain corresponding AMI models from their IC vendors and follow the same process to give these model a try. For an IC vendor, the AMI model generated here will also be compatible with other vendor’s tool and you may provide these models to your system clients before committing to perpetual version of the model. Here you have it…. an economic yet efficient channel analysis which can be done directly through the web has been enabled for your design needs without any cost! At the DesignCon IBIS summit this year, the second half of the meeting focused on the trend and possible approaches for equalization modeling for DDR interface. 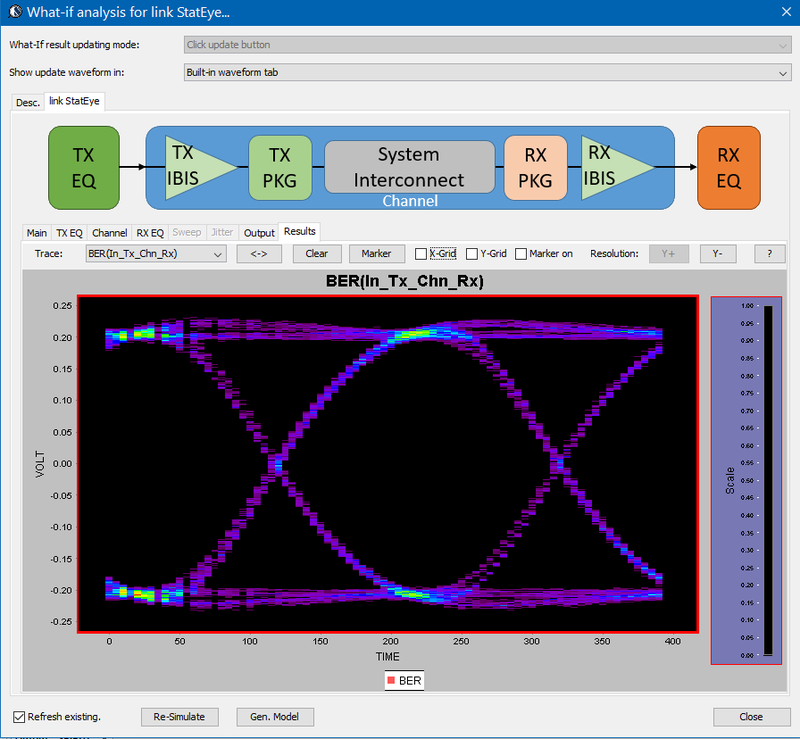 For the past several years, IBIS-AMI modeling and stat-eye like link analysis have been applied widely and successfully on the SERDES interfaces. DDR, on the other hand, didn’t consider EQ much until recent DDR4 3200 or faster or upcoming DDR5/DDR6 standard. Whether AMI like model and SERDES like flow can be applicable to DDR are still topics of discussion, as the AMI spec itself still doesn’t support DDR properly yet. Nevertheless, the trend indicates that EQ model being part of the DDR simulation will be inevitable. At the summit, representatives from EDA vendors focusing on AMI and VHDL based approaches and a DDR manufacturer have shared their studies. Interested reader may find related presentation at the IBIS website. Following up these discussion, we at SPISim also performed several experiments of AMI on DDR. In this blog post, we would like to share some of the considerations on this topic as well. A SERDES channel is point-to-point, as shown above. Signals started from a TX propagate through the channel are received by one RX. This Tx-Rx connection may be cascaded in several stages with repeater being used in the middle. A repeater itself contains a Rx and Tx. Repeater may be required as SERDES interfaces may extend very long…from controller to the edge of the board and beyond to connect to external devices (USB, SATA etc). Nevertheless, a SERDES channel looks like a single long “chain”. Thus the nature of the SEDES is “long” and “lossy”. DDR, on the other hand, is multi-dropped by nature. There is usually one controller on board but several “DIMM”s connections on the other ends. For example, a typical laptop has two SO-DIMMs at least which has combinations of being soldered on board or plug-able through memory sockets. The desktop or server board will have more DIMMs to allow more installed memory. 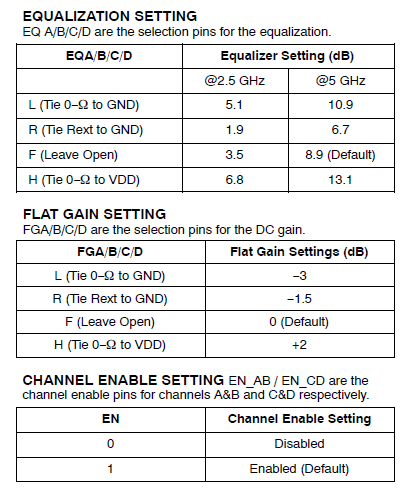 Depending on it’s dual channel, 3-channel or quad-channel etc, they may come in pairs of 2, 3 or 4 respectively. These memory modules usually do not reside too far away from the controller in order to avoid latency, thus no repeater mechanism is needed. The DDR’s topology presents a “short” yet “reflective” nature due to the impedance change at branch points and different termination within each DIMM modules. SERDES interface are differential, that means they are more immune to noises such as voltage droop or ground bounces, as both P and N signals are susceptible to the same effect so the overall noise is cancelled out. That’s why power-aware models starting from IBIS V5.1 are rarely needed for SERDES. DDR, on the other hand, has many single-ended signals. All the DQ byte lanes are singled-ended so power noise is of a major concern. Another architecture difference is clocking mechanism. SERDES uses embedded clock so clock signals need to be recovered at Rx from encoded bit-stream (e.g. 8b/10b), which is also part of the transmitted data. A CDR is needed to recover such clock signals and it itself is level sensitive/dependent. DDR uses source synchronous so clock is transmitted separately. For SERDES, there is one direction of signal propagation. Schematic-wise, Tx located at the far left while Rx sit at the far right. Some of the DDR (e.g. DQ) has both read and write modes. 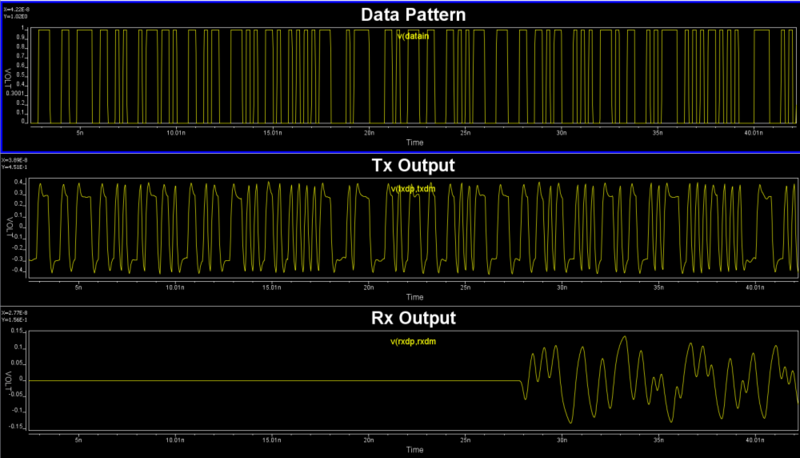 Both the controller and memory module can serve as Tx and Rx roles in different modes so the signal is bi-directional. In addition, there are different on-die-termination (ODT) in DDR so the impedance of different DDR module will be different depending on which one is receiving/driving. This “combinatorial” characteristics increases the complexities of EQ optimization as more dimensions need to be swept or analyzed. Until recent years, the analysis methods for DDR and non-DDR interfaces are very similar. Topology (either pre-layout or post-layout) are composed or extracted for spice-like analysis in time domain. Worst case pattern may be decided in advanced or just perform long enough simulation to cover sufficient bit sequences. Time based or related performance parameters are than processed and compared against spec. to determine the channel performance. With the higher bit-rate and low BER requirement, this approach is no longer valid for SERDES. StatEye like convolution based simulation has replaced spice simulation and EQ modeling are also changed to accommodate this analysis requirement. That is why the AMI are getting popular and important these days. We start seeing EQ in DDR4 3200 and will sure to see that being part of upcoming DDR5 and DDR6 etc. 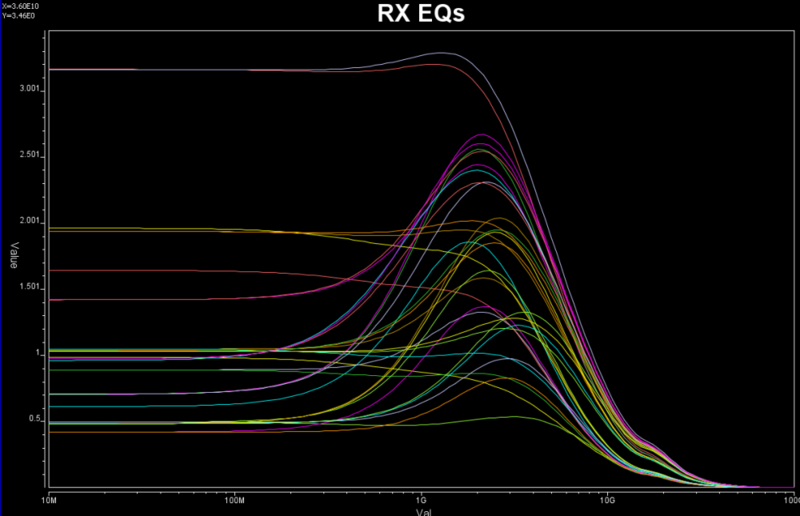 So what are the EQ modules we often used in SERDES can be applied to DDR? FFE: Feed-forward equalizer. It uses various numbers of taps and weight to eliminate or de-emphasize the signals at different UI. 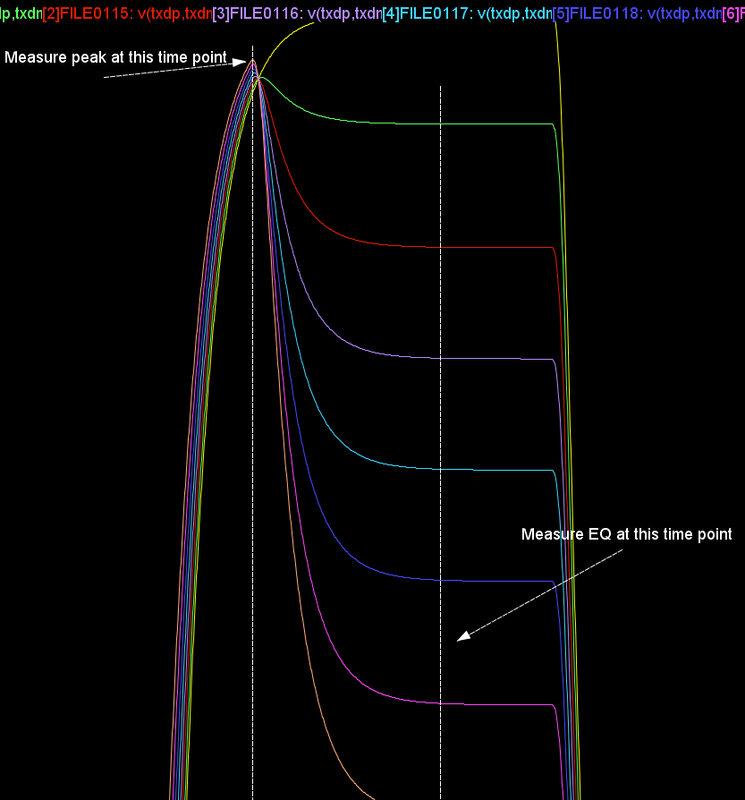 As DDR is quite “reflective”, this EQ method should improve the link performance as it can be used to cancel ISI. The challenging part is that FFE tap weight is pre-defined and may not be adaptive during communication. The screen-cap below show FFE effect on either single-ended (SE) or differential (DP) signals of different tap location. As DDR channel is short but not that lossy, it’s been shown that CTLE is not that useful comparing to its role in SERDES. While this is another form of ISI cancellation, it can be applied dynamically based on the link condition. So there is a period before the DFE will “lock-in” with stabled tap weights. For this reason, it has similar effect as FFE for a reflective channel yet may be more versatile. However, the DFE itself is non-linear so it can only perform in bit-by-bit mode. In contract, FFE is a FIR and can be used in both statistical and bit-by-bit mode simulation. Both FFE and DFE alone will open the closed eye significantly yet when used both together, the results is not much different from only using one of them. If this is the case for most DDR cases, then the important topics is to perform “sweep” efficiently in order to find out number of taps and weights required in either FFE and DFE module used. 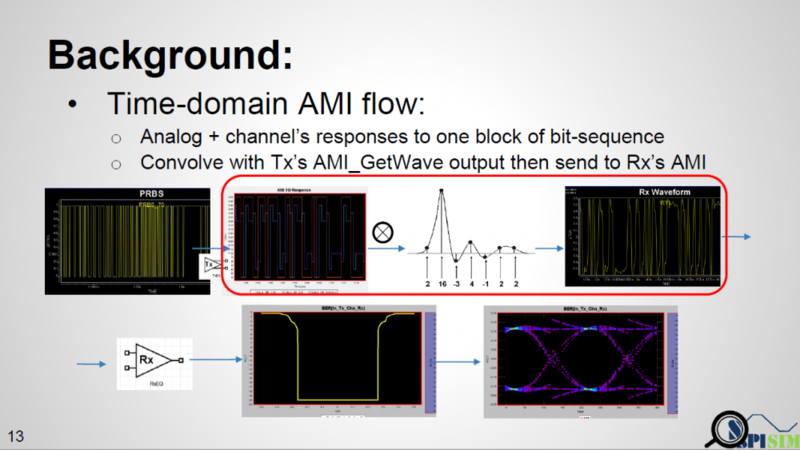 In the spec, the “statistical” simulation flow describes that a channel’s impulse response is sent into Tx in the AMI_Init call. Practically, such impulse response only exists in theory and is not easily obtainable with circuit simulation. Instead, most link analysis use step response then post-process by taking derivative to obtain the impulse response. The assumption of this approach is that channel’s rising and falling transition are symmetric, which is usually not the case for single ended signals such as DDR. Thus in order to perform StatEye like convolution based link analysis more accurately, one may need to forgo the single impulse based statistical analysis flow but resolving to full sequence based (e.g. PRBS sequence) bit-by-bit flow. The usage of this clock_time is “output” from the AMI model. That is, the (RX) model can optionally recover the clock from the “*wave” array then return the clock data back to circuit simulator. As mentioned previously, DDR is source synchronous so a clock signal is already available outside the “*wave” data. In my opinion, this is an easy change as the spec. can simply indicate that the “clock” data can be bi-directional, meaning that simulator may receive clocks elsewhere then pass its data into the AMI model using this clock_time signature while calling the AMI API. Then the RX’s DFE can make use of the pre-determined clocks to perform slicing and tap adaptation. Nevertheless, this clocking difference has not yet been addressed in the spec. as of today. By definition, a LTI EQ model’s transfer function is independent of the inputs being scaled and shifted, thus it basically behaves the same regardless of single-ended (SE) or differential (DP). 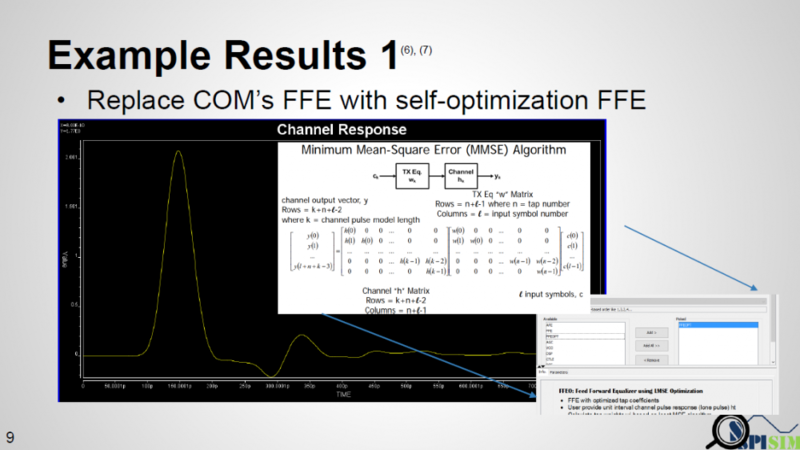 A NLTV model, like RX DFE, does depend on the proper threshold to determine signal data bits. Thus whether it’s SE or DP does make difference just like whether the encoding scheme is NRZ or PAM4. Besides those descriptions change like shown above, a simulator/link analyzer can theoretically perform signal shift before calling AMI model then restore afterward automatically so that most of the developed AMI model mechanism can still be used. Alternatively, an AMI model can achieve similar effect using a level shifter if the spec. indicates that such adjustment will not be performed by the link simulator. 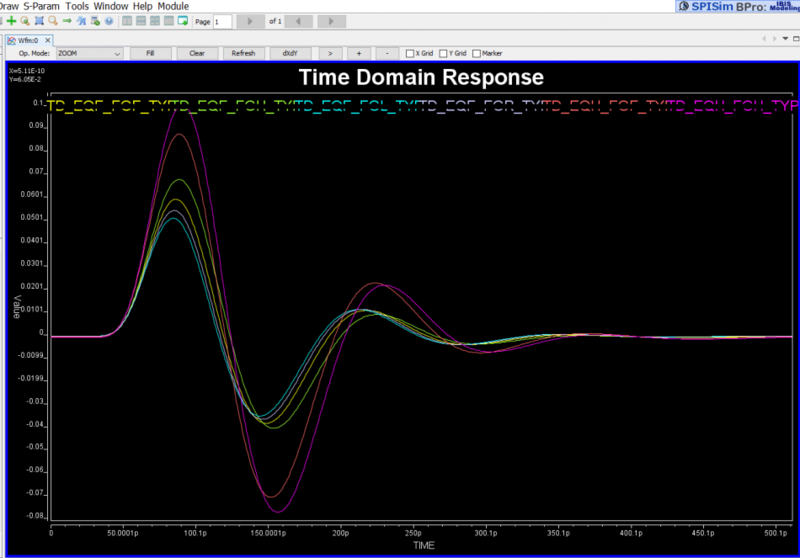 The waveform shown above is a 3rd party vendor’s link simulator being applied to DDR analysis using IBIS-AMI. As one can see in the left, the channel characterization shows that the voltage swing of the single ended model is 0.4 volt ranging from 0.95 ~ 1.35. 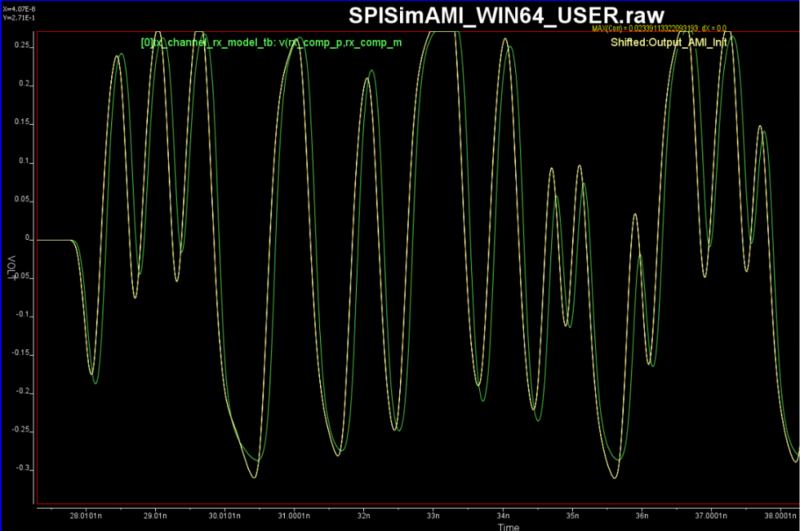 However, the waveform sent to IBIS-AMI models has been re-centered around 0.0 so the swing range is -0.2~0.2. Apparently, what the simulator has done is taking the ground based channel characterization result to convolve with differential stimulus required by the spec. 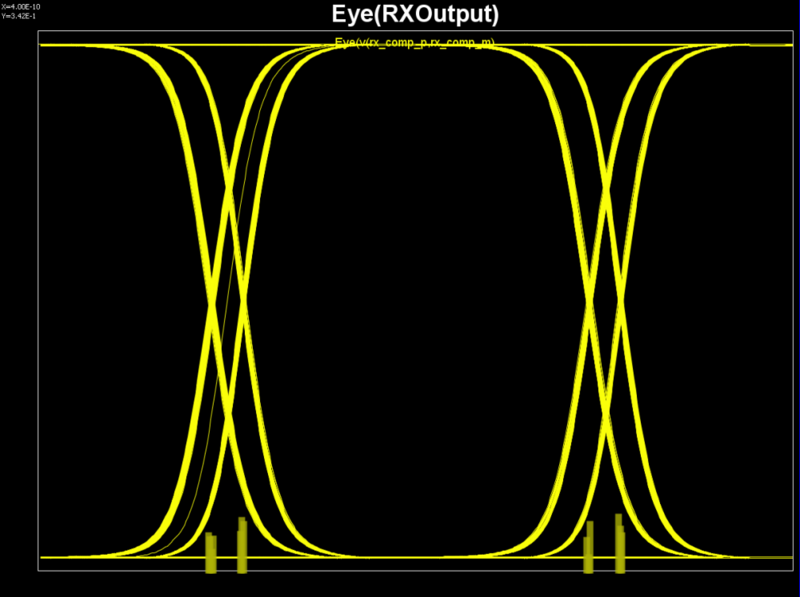 This vendor’s simulator then does smartly restore the output from AMI model back to single ended so the final eye presented are shown at correct voltage level. Libraries: performing numerical computation in C/C++ is quite routine and many libraries have been developed so very rarely one needs to start from scratch. For example, GNU and LAPACK are both widely used as foundations of C/C++ based numerical analysis. Where are these counter parts in VHDL/Verilog-A? Without these, model development beyond simple sequential programming will be almost impossible or too tedius. IP Protection: Compiled C/C++ codes are basically machine codes and can’t be easily de-compiled. This is why AMI is considered as IP protected while IBIS is only abstract to the behavioral level. VHDL/Verilog-A are mostly plain-text based and even when encryption/obfuscation is possible, the model soon becomes vendor simulator specific because only they can decrypt/interpret the scrambled codes. This defeats the purpose of the shareable model. The discussion above summarizes my understanding and observation of EQ or AMI’s usage for DDR. While the implementation may not necessarily be the same, I believe we can rest assured that EQ will be part of DDR spec to come. Even if it’s not AMI, it will just be built on top of existing modeling methodologies so far just like AMI stands on the shoulder of transitional IBIS. Many years ago when I entered the signal integrity field, we analyzed the channel by performing spice-like simulation for several hundred nano-seconds at most. Post-process were then done to get FOM metrics. At that time, the bus speed was barely around 1Gbps. These days, high speed-IO SERDEs are common among various computing devices and their speed reaches multi-Gbs or higher easily. Not to mention the several new 802.3 network protocols which have even higher speed (50G~ >100GB). With such high data rate, one needs to “simulate” number of bits at 1E12 level to reach certain bit-error-rate (BER, say 1E-12) with certain confidence level (CI, say 99%) . As such, traditional SI analysis method is no longer valid because it is simply inpossible to simulate so many bits in reasonable time using spice-based simulator. A new channel analysis methodology, like link analysis, is thus needed and invented around year 2003 to address this problem (e.g. StatEye). For link analysis, traditional buffer models such as IBIS are not much useful as they mostly time-domain based. Algorithmic modeling interface (AMI, a subset of IBIS) models are used mostly instead. AMI modeling is very technically challenging, it requires cross domain expertise such as simulation, modeling and C/C++ programming across different OSes and platforms. Thus it usually takes much longer for an engineer to ramp up to be able to develop and deliver a model when comparing to traditional IBIS. Two of the big hurdles which cause this slow ramp-up for AMI modeling are the requirements to express the circuit’s behaviors in C/C++ language and then be compiled according to Spec’s API requirements. To lower such barriers, we are asked often: 1. Can we create an AMI model using scripting languages? 2. Can I simulate existing spice models using link simulator before committing to develop a full blown C/C++ version? We propose approaches to meet these two common requests in this presentation. Channel analysis: Nowadays the high speed link analysis most definitely includes stages such as Tx/Rx EQ, which are beyond traditional IBIS. 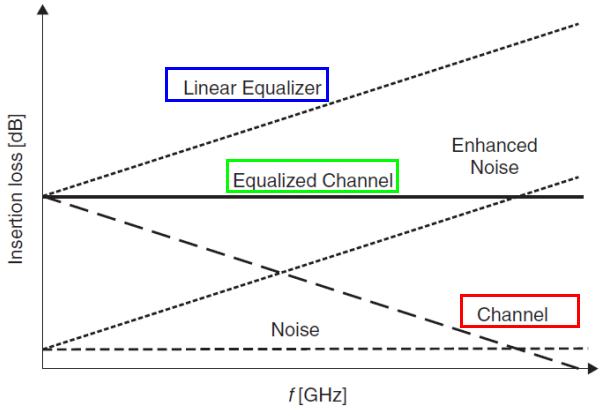 Equalization is needed to compensate channel noise such as inter-symbol interference (self-channel interference) and crosstalk (co-channel interference). 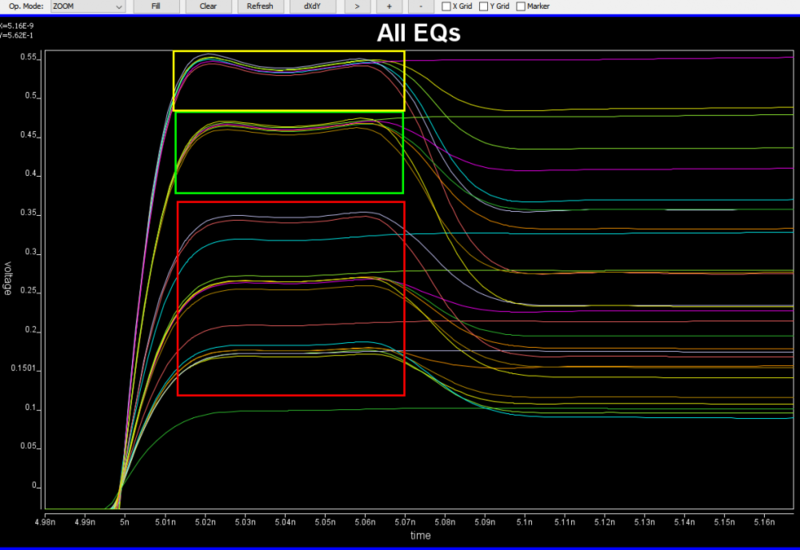 These EQ stages can open “eye” from a closed one of a noisy channel, represented by S-parameter interconnect. 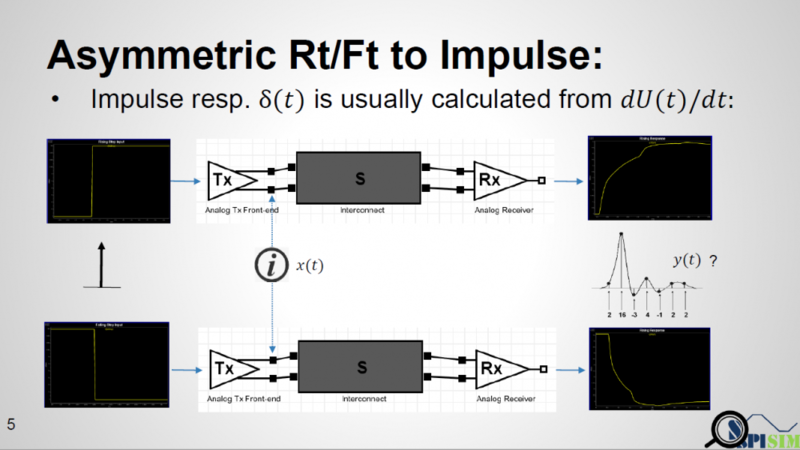 Statistical: If the circuit is linear time-invariant (LTI), one can obtain many information about channel’s limit by using a single pulse or impulse response. In this flow, a channel is assumed LTI (s-parameter may need to be enforced/fixed in terms of causality, passivity etc first). Its impulse response is then “fed” into Tx/Rx circuitry to obtain the response. By using superimpose (or superposition), response of the channel + circuitry of different UIs are added together and probability of various BER level can be computed from there. Bit-by-bit: If a circuit is non-linear time variant (NLTV), then such superposition is not allowed. In that case, a bit-stream may be fed into Tx/Rx circuitry by link tool/simulator to obtain their continuous time-domain response. These outputs are then “convoluted” with LTI channel to obtain overall channel response. In order to do this for many millions of bits, some assumption needs to be made (high-z, to be discussed later) in order to gain speed performance when comparing to same time-domain spice-like nodal analysis. Also, the link tool may break bits to several chunks and feed to Tx/Rx separately before combining them together, with “aliasing” of adjacent chunks of bits being taken care of properly at the link tool level. AMI models support both of these two channel analysis methodologies. .ibs file: In the .ibs file, there is a section called “Algorithmic Model” which points to the paths where the .ami and .dll/.so files reside. This keyword block also provides info such as bit, OS platform and the compiler used to generate the .dll/.so files. Other than these info, the .ibs file and AMI model it points to are basically independent. 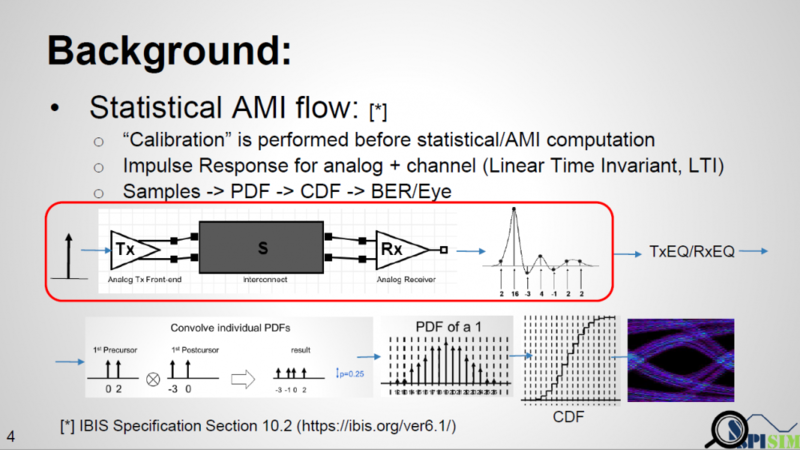 Further more, in the link analysis, traditional IBIS part are often considered “analog front end” and is “absorbed” into either the AMI portion or the channel portion of the data. .dll/.so file: This is compiled binary format. The language MUST be plain old C and it must be compatible defined AMI API spec. in order to be able to loaded by the link simulator. Reserved Parameters: This block is usually at the top of the .ami file. These settings are for link simulator only. Depending on part of the settings in this block, such as “Resolve_Exists” or “GetWave_Exists” set to true or false, the associated API functions are invoked by the link tool. Model Specific: This block is usually at the bottom of the .ami file. It contains AMI model developed defined parameters which link tool and API spec does not interfere with. While there are many “text” in this block, when the .dll/.so portion of the AMI model received their info. passed by the link tool, they have been “filtered” and converted to simple “name-value” pair as shown above. So while the depth of the “tree structure” for this model specific section can have many levels, the parameters received inside the model can be just two levels at its simplest form with model name (RX_model above) at the root and the other name-value pairs as “leaves”. Among which, AMI_Resolve and AMI_Resolve_Close are for string parameter pre-processing which can be ingored in a lot of cases. AMI_Close is like garbage collection/clean-up to release allocated memory, so is trivial is most cases as well. Modern OS may reclaim memory space back even one does not do any “Free” or “Delete” there in AMI_Close. 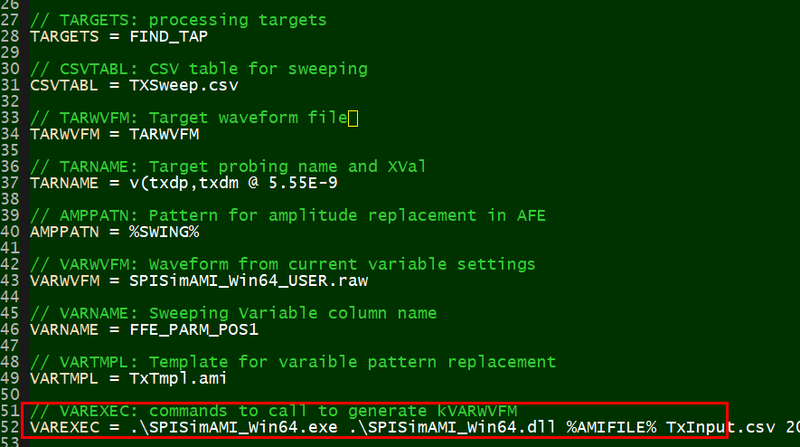 Two most important ones, AMI_Init and AMI_GetWave, are marked in red. In particular, they participate in the aforementioned “Statistical (for LTI)” and “Time-domain bit-by-bit (for NLTV)” models. That is, for a LTI model, its AMI model must/should implement the AMI_Init function call. A LTI model can also implement AMI_GetWave function call but this is optional. On the other hand, a NLTV model must implement AMI_GetWave function while implementing AMI_Init as “initialization” rather than “computing” portion of the codes. The bit-by-bit convolution part of a NLTV model should be implemented in the AMI_GetWave part of the codes. When looking at the function declaration part of the spec, as boxed in red in right part of the image above, one should also realized that the first arguments (an array represented by double pointer) serves as both input and output purpose. These are “pass by reference” arguments as they are pointer. 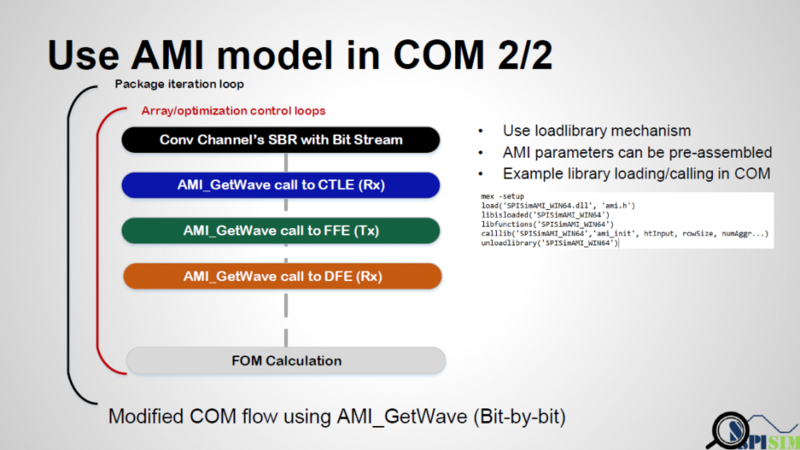 So at the beginning of the AMI_Init/AMI_GetWave calls, the model can obtain either impulse response of the channel or digital bit sequence from the simulator via this pointer. Then the model perform necessary computing using info from the rest of the arguments (some of them also serve as output purpose, such as char **msg, but is not that important in this context). At the end of the computation of this function call, the modified response must be filled in back to the address where the first arguments points to, so that the link simulator will retrieve the values and carry on the rest of the analysis. Identify the behaviors of circuits being modeled. As we are going to use a computer language to describe the model’s behavior, we must know how it works first. These behaviors can be obtained via either mathematical derivation, simulation results or measurements. In the last two cases, a look-up table may be used inside the model. Code the behavior and IBIS-AMI API: There are two parts of this section. The API part MUST be implemented in C (not even C++). The other part of the codes can be in any language, shape or form as long as the developed C codes know how to communicate and exchange the data. That is, the actual computing part, can be in language other than C/C++ if you like or even be completed via circuit simulation. Now let’s talk more about item 2 above. There are many considerations on how you should code this part. A specifically C/C++ coded model for one circuit will mostly run very fast. However, it may requires frequent re-compilation/re-testing when new design comes. If we can make this part as simple as possible and non design specific, such as calling external scripts, then this work may only need to be done once as all the variation are now external to the compiled .dll/.so. To support script based AMI modeling, we need to have a thin API implementation (in C, as required by AMI Spec) whose sole task is to translate all the received arguments into a text format and write as a text file. It will then pass the path of the text file to user defined scripts or batch file via system call. Location and type of the script is defined in advance in plain-text .ami file. The script needs to retrieve the argument information first by parsing the plain text file, perform necessary computing, then write into another or same text file which this AMI model with thin layer knows where to find. So when the script completes, the AMI model will parse the text file generated by the script, fill the information back to the aforementioned “passed by reference” pointer array, then complete this step. As discussed, whether the scripts is needed for either AMI_Init or AMI_GetWvae or both are pre-defined based on circuit behavior. And since this is developer chosen favorite language, parsing and writing to text file should not be an issue when comparing to say C language. Lastly, should there be any information need to be passed between API calls (such as model member’s values between AMI_Init and AMI_GetWave), they can also be file based. To summarize, the AMI model with thin layer completes the API calls with upper simulator like other regular AMI models. However, its “transactions” with underlying user’s scripts are all file based. A matlab example of the AMI_Init is shown above. In the matlab codes, it first calles parseInput function, which is a text file prepared by the thin AMI model and contains input waveform. It then performs computation such as convolve with FFE, then the result matrix is written back to the text file via storeOutput function call which thin AMI model know where to find. Since matlab’s “conv” function is used directly, the model developer does not need to deal with c-based implementation details such as memory allocation FFT/iFFT in some cases or other math library linking/compilation. 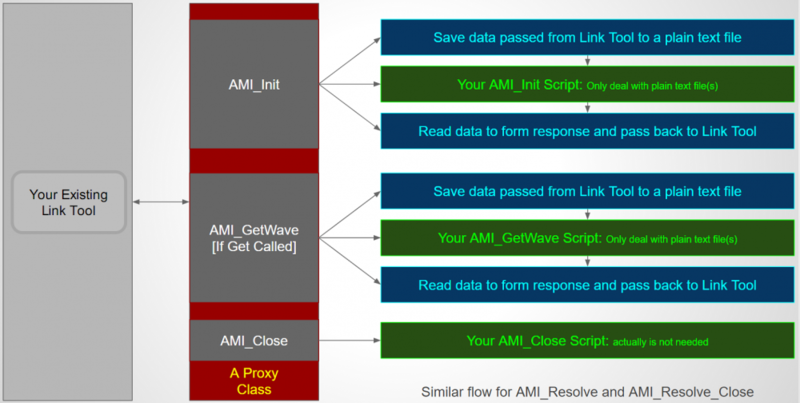 Performance and distributional: Since all communications between thin AMI model and user’s script are file based, it inevitably will suffer some performance issue. If this is AMI_Init, it’s only called once by simulator during analysis and such performance penalty is less of a concern. Next, one must also consider the how the mode can be distributed? If the script is in matlab .m file, then model clients need to have matlab environment installed as well. If it’s in compiled matlab, then client needs to install matlab compiled runtime (MCR). If the scripting language is in perl, then perl interpreter, which is usually installed by default on linux but not Windows, is needed. To distribute such interpreter, one must also check the license terms and then also think about the elegance of such model release. Consider Python! : Python is a very worthy candidate here because it has rich math or matlab like libraries such as SciPy or NumPy. More importantly, there is a mechanism called “embedded python” in which the whole python interpreters together with math libraries used can be bundled and distributed in a single zip file. That is, the end user does not need to install python environment first as the thin AMI model already linked with C-Python and can find all required functions in either user’s scripts or bundled zip file. Now that we know a thin layer can call external script either directly or via its interpreter, we may also come to the conclusion that it can also call external program such as a circuit simulator. This is of course true!. An assumption we mentioned at the beginning of the post is the “High-Z” condition. In a typical spice-like nodal analysis, there are many “Newton-Raphson” iteration going on within same time step. At the beginning of each Newton iteration, tentative voltages are given at each node. Each components then compute the drawing or output current into these nodes based on these voltages and its own behaviors. At the end of the iteration, circuit simulator solves the system matrix to see whether KCL/KVL reaches balance and then determine either another Newton iteration is needed or it can march into next time step. 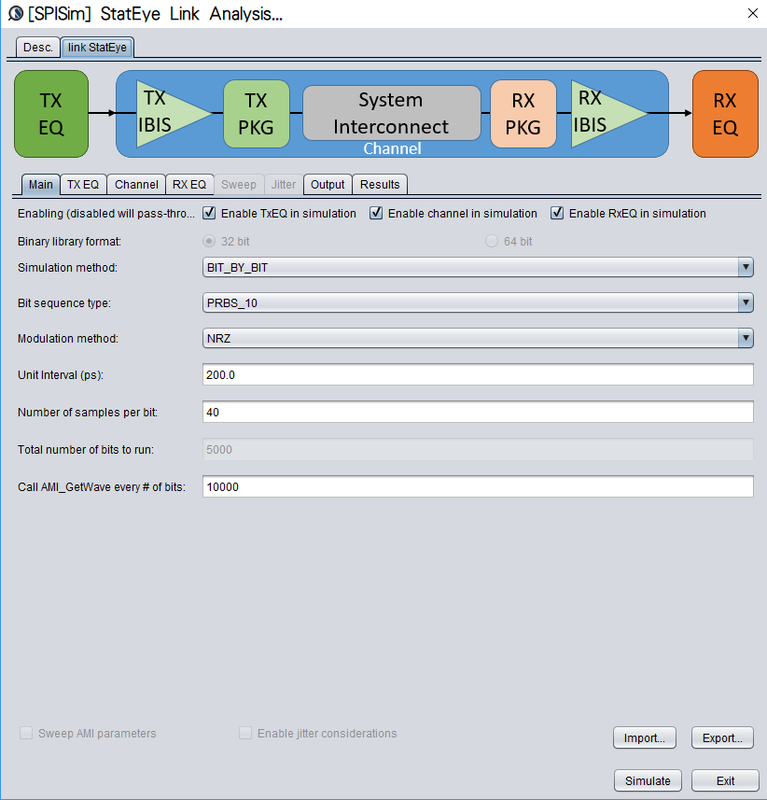 In channel simulation, such iteration is not needed as there is a “High-Z” assumption… and that’s why it can run much faster than nodal spice simulation. In High-Z assumption, each blocks is assume to have high input impedance and output impedance so it will not draw any current at the input and the output is set once determined. 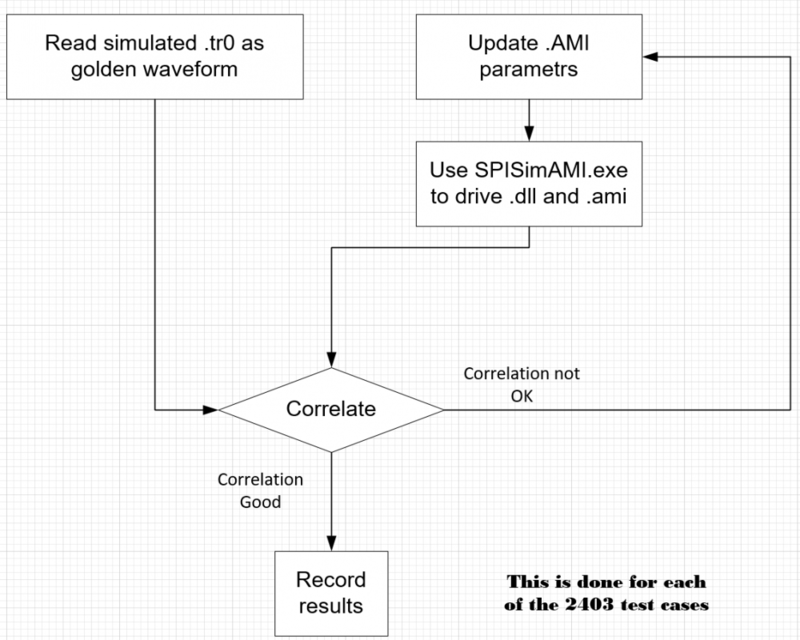 Since the thin layer AMI model can obtain the inputs from simulator via API call, if it can perform another task… such as convert this inputs input PWL source with time step equal to UI/number_sample_per_UI (both are know and passed by the simulator), then it can theoretically call a simulator to drive user provided spice subckt like above. Note that the input waveform is just voltage which represents potential difference of two nodes. So there is no reference to GND at all. It’s subject to user’s spice circuit to determine what the reference is and provide GND reference if needed. The picture above shows the flow to simulate/model AMI with spice subcircuit. It is very similar to the flow for AMi with scripting language. First the thin layer AMI model need to generate a PWL source dynamically based on the provided inputs. Then form (either write out as a file or internally in memory) a netlist as a driving circuit and probe at the output. This driving circuit will use user provided spice subckt with possible value overrides defined at the .ami file. Then thin layer AMI will call external spice simulator (or internal API) to perform nodal based simulation. The output (like .tr0 for HSpice) is then processed and its value is again filled back to the initial API pointer array to return back to upper circuit simulator. An example is shown above. The template is pre-defined with the PWL source and path to user’s spice circuit being left to be filled-in. The thin AMI generates the netlist with all values filled properly upon being called by simulator. It then call external simulator to do nodal simulation. Resulting waveform are post-processed and filled-in to the API argument memory address and complete this API call. Similar to the AMI modeling with script language case, there are several considerations when adopting the spice-based AMI modeling approach. First is the performance… as each AMI API call involves nodal simulator initialization (allocate matrix, solve for DC, Newton iteration between each time sample etc), it will be significantly slower than pure C implementation. However, this is less of a concern if only AMI_Init is needed as it’s called only once. More over, one does not need derive any equation or do any coding at all and can get accurate link performance using this Tx/Rx circuitry directly… so development time is saved significantly there. If one decides to implement such block in C/C++, then simulation results obtained during this process can serve as a very good reference or correlation data for C/C++ based model to be developed. Another consideration is again the distribuability: If this spice model has particular MOSFET model and requires say HSpice, then the AMI model recipient also needs to have HSpice in their environment in order to run. While commercial simulator like HSpice may not provide API or serve as shared library, many open source ones do. Examples are NgSpice and/or QUCS. In these case, the compiled thin AMI model is basically a simulator in .dll/.so form and can perform simulation all by itself. The binary size is around 8MB larger then without as it also needs to link with all simulator supported device models as well. 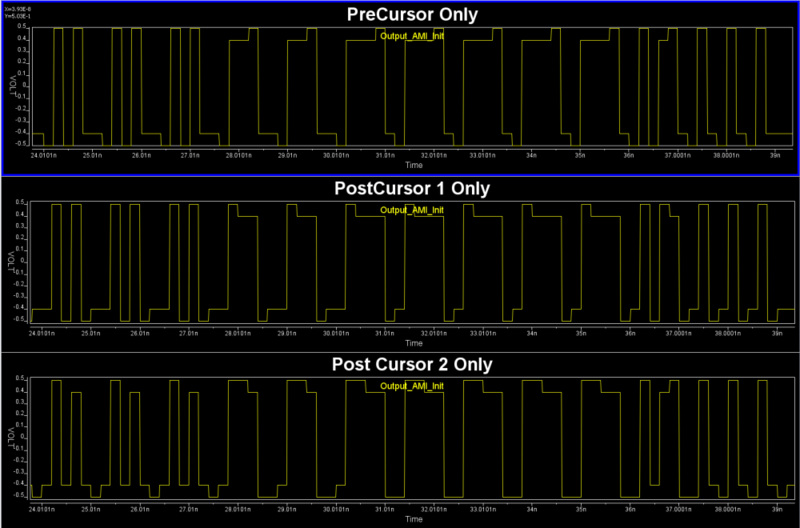 Using either scripts or existing spice circuits for AMI modeling is actually doable. The presentation I give here is not just talk on paper. The implemented “thin-layer AMI” and examples are also provided together with the slides. 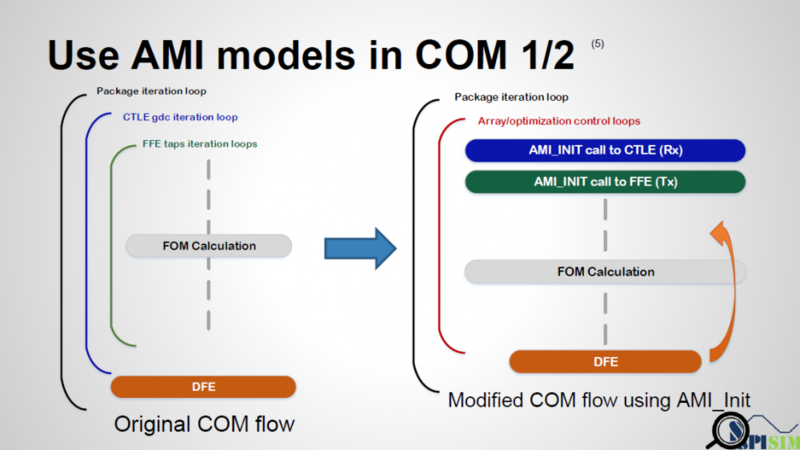 These flows can be considered as part of the AMI development process as they can shorten the modeling cycle significantly while providing data for correlation should one decide to go full C/C++ implementation at the later stage. The consideration points includes performance, elegance of released models and distributability of either the script’s interpreter or simulator. Also a thin layer AMI models is needed. This thin layer API is called Proxy model in computing science terms. As a matter of fact, SPISim has implemented such proxy models and made them available for public to use free of charge. [Link Here] Having that said, this API model only needs to be done once as all the model variation are located externally in user scripts/spice models. and thus require no re-compilation when design changes. 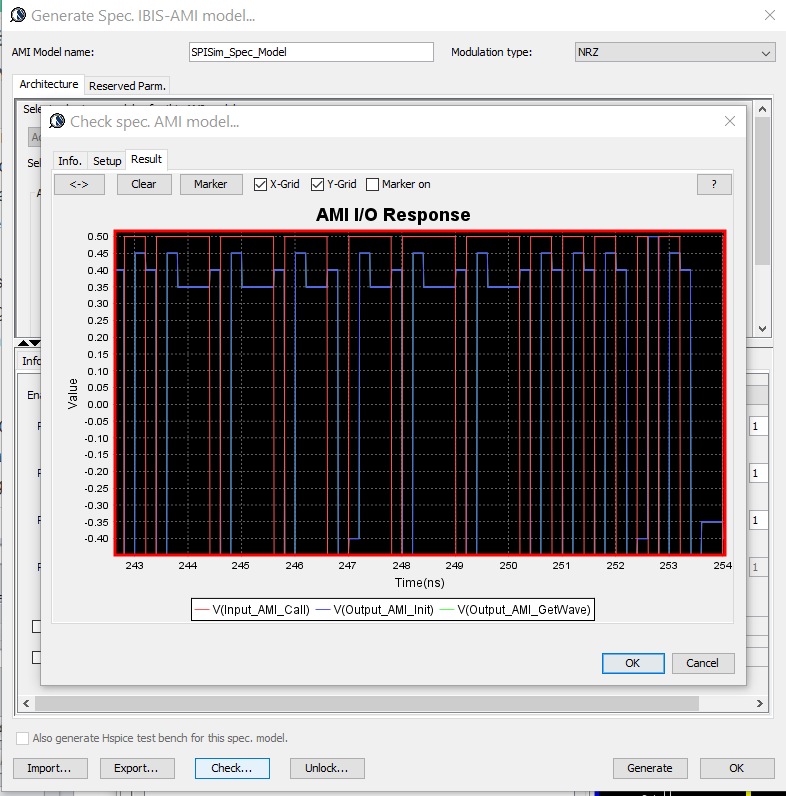 Nevertheless, these two possible modeling approaches provide an AMI model developer alternative ways to decide on how a model can be developed more efficiently and effectively. IBIS-AMI modeling is a task usually executed at the end of IP development process. That is, hardward IPs are created first, then associated AMI models are developed and released to be accompany with this hardware IP since the IPs vendor usually does not want to expose the design details to the their customers. On the other hand, it is also likely the case that a user may have received behavioral or encrypted spice models first, or even obtain measurement data from the lab, then would like to create corresponding AMI models for channel analysis. Such needs arise usually because either original IP vendor does not have AMI model or may charge too much. It is also possible that end user would like to explore different design parameters before determining which IP/part to use. Both Tx and Rx are encrypted hspice models with adjustable parameters. 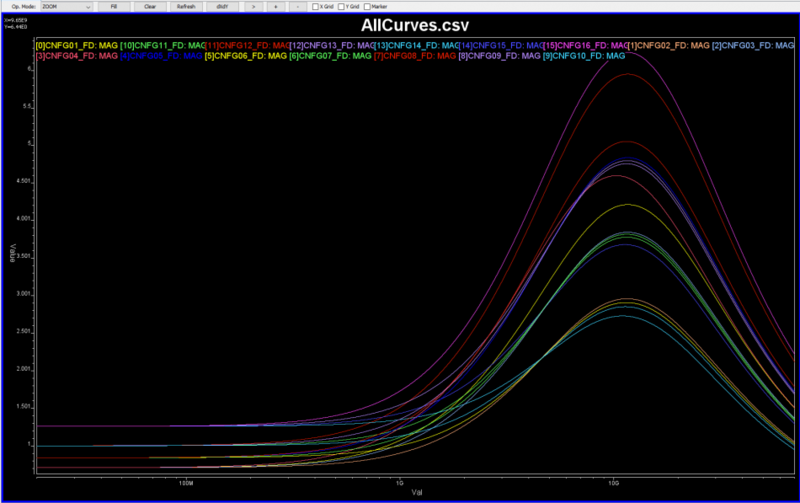 When picking one set of parameters to test run the channel test bench, we get valid simulation results. As this is a hspice netlist, we have the freedom to probe different points and change the simulation options as needed (for example, from transient to ac or transfer-function). The original IP vendor only provides simple descriptions for various blocks and design parameters. 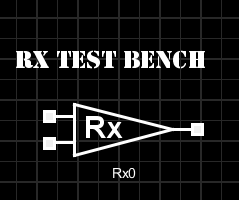 The Tx and Rx packages are spice sub-circuits and channel is a s-parameter file. 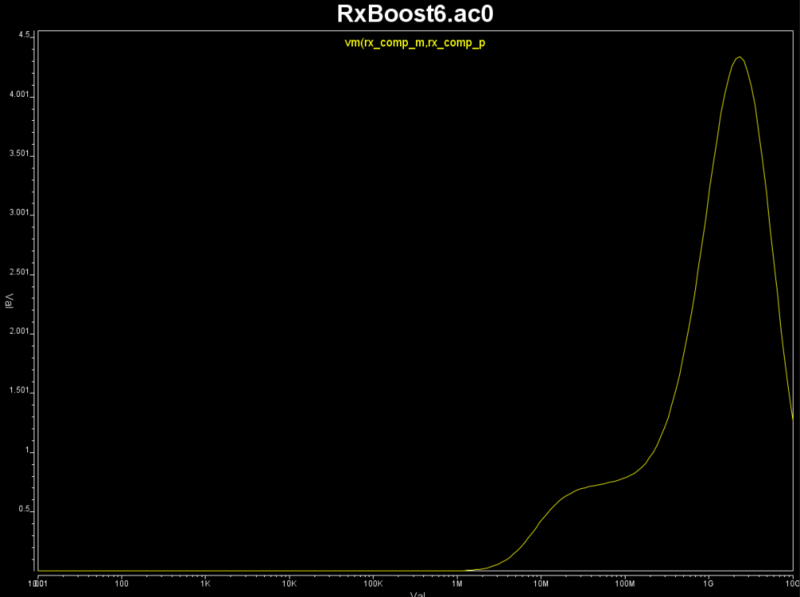 Both Tx and Rx model has typ/min/max corners. On the Tx side, there are settings for voltage supply which is independent with the corner settings, a 7-bit resolutions for a multiplier to work with the swing amplitude, a 6-bit resolution for a de-emphasis and a flag for turning-on/off the boost. With these IP design spec, the modeling goal is to create associate AMI models which will allow end users to fine tune performance with similar parameters like original IP. Further more, SPIPro is used for its spec. AMI model so that model developer should not need to write any C/C++ codes or perform any .dll/.so compilation for this AMI modeling. While the full channel test bench demonstrate how the Tx/Rx work, it also includes information not needed in the AMI modeling. For example, package and channel are usually separated from the AMI model because they are usage or client specific. Besides, as mentioned in previous posts, one assumption of AMI model is high-Z input and output. So the first step of the modeling is to separate channel from driver/receiver and create Tx and Rx only test bench together with inputs and outputs. For Tx, it’s a simple PRBS input with output connecting to 50 ohms loads. Now that we have input data and desired output for this particular set of parameters, next step is to explore whether SPISim’s existing spec. model is sufficient to meet the performance. Swing range and offset are different between input (0 ~ 1) and outputs (-0.5 ~ 0.5). Also there are loading effect so rising and falling have RC charging/discharging like behaviors. We change these pre and post cursors one at a time only, using -0.1 for value . 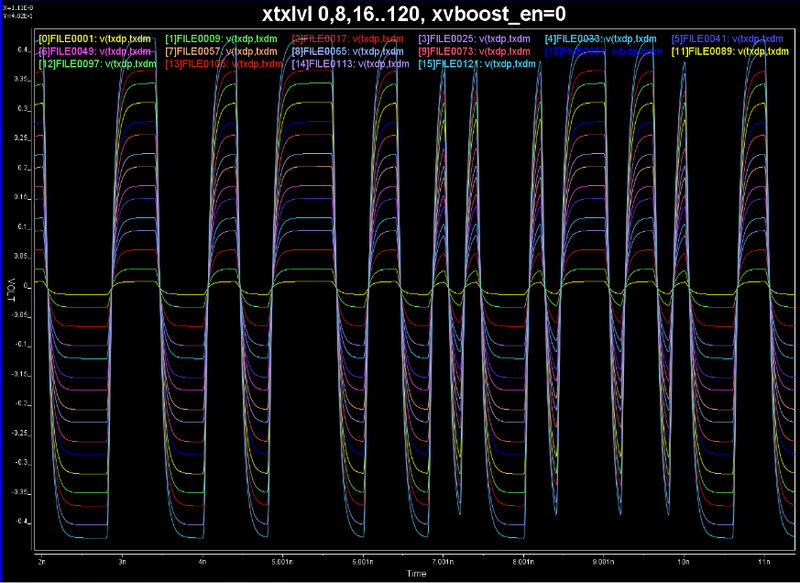 From the summary plot above, and correlate with the Tx output, it’s apparently that this Tx has one post-cursor FFE beause only this set-up gives de-emphasis after one UI after the peak. From these correlations, we believe that the stages built-in to the SPISim’s AMI are sufficient to meet the performance needs. So next step is to find the parameters to support all these design specs. As similar process between Tx and Rx, we will use Tx as an example to demonstrate the flow. Before generating a simulation plan, we first also make sure these design parameters are independent with each other. We performed simple 1D sweep (several points) in particular for the swing and de-emphasis level. Notice that the slew rate and peaks are not affected by de-emphasis level much. In addition, the spacing seems linearly spaced according to the bit settings. With this, we can sweep them independently. 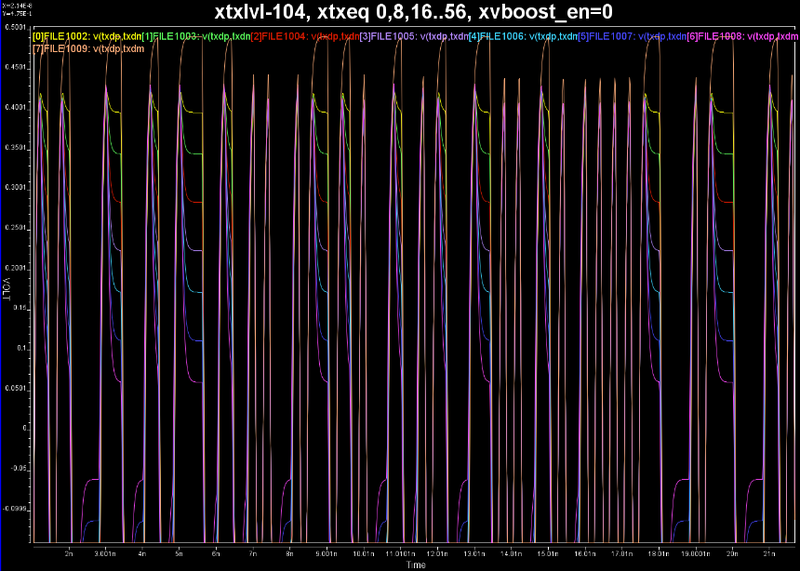 Now for Tx, a full factorial sweep will require 2^6 (de-emphasis level) * 2^7 (swing level) * 2 (boost flag) * 3 (corner) * 3 (voltage levels) ~= 150000 runs. 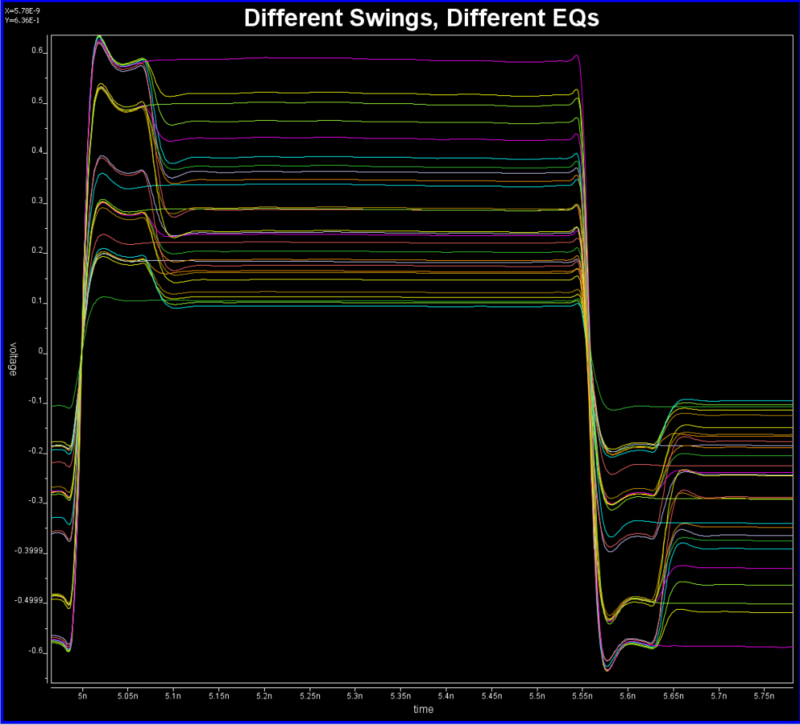 Due to the linearity, we do no need to sweep full 6 and 7-bits of de-emphasis and swing levels. 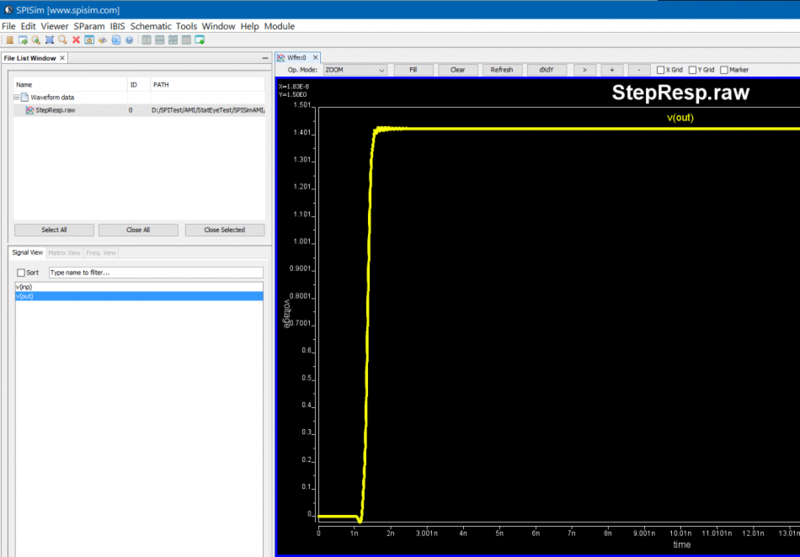 Instead, we increase step interval for simulation because SPISim’s model’s built-in interpolation can be applied automatically, more about this at the model release section. Noticed that variables are enclosed with “%” (e.g. %XVPTX%). Their values are replaced by corresponding values in each row of the table to generate a new spice file. With all these 2403 spice file generated, each for different combinations of parameters, we kicked-off the batch mode simulation and obtained all two thousand cases within one hour. This is done all within MPro and can also be done using user’s script. Apparently, such as task is too tedious and error prune for a human to perform. Since the input pattern is the same, relative timing locations of different properties (such as peak and de-emphasis levels) are also the same even between different test cases, we can process these data automatically. Regarding “adjusting” AMI parameters, a simple bi-section search will quickly converge to the desired de-emphasis tap values for the given test case. 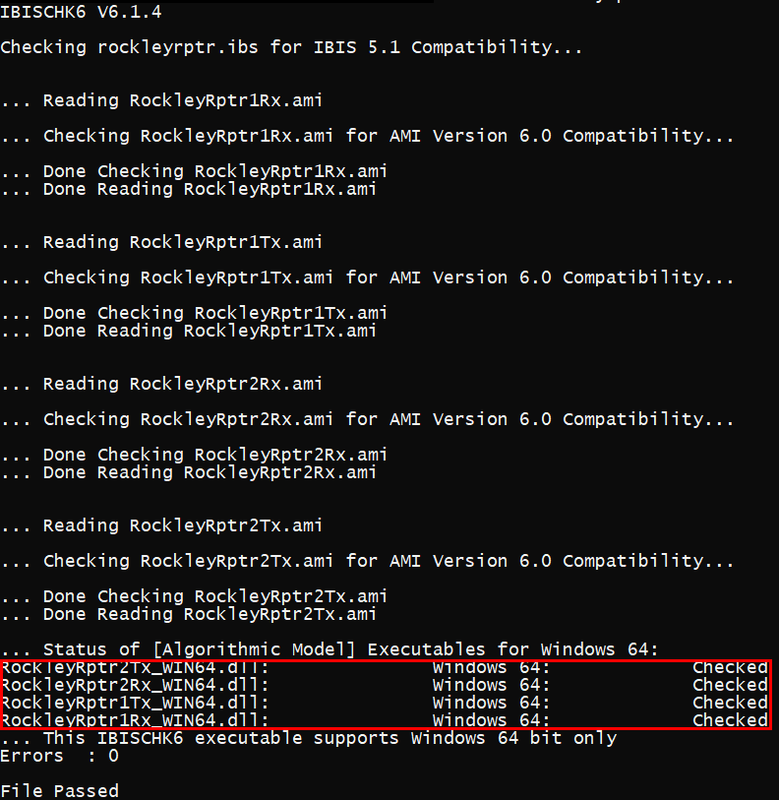 In our process, we first parameterized the .ami file as shown below. This ami file is based on the architecture identified in the second step… only that now we need to find different values for different parameters. In particular, the swing level and FFE post tap are unknowns and need to be swept. Because these two variables are independent, we can first identify the peak value as “Swing” from the .tr0 simulation results, then use bi-section to adjust the FFE_PARM_POS1 such that the output from SPISimAMI for this .ami file settings and SPISim’s spec .dll/.so will match the tr0 data. 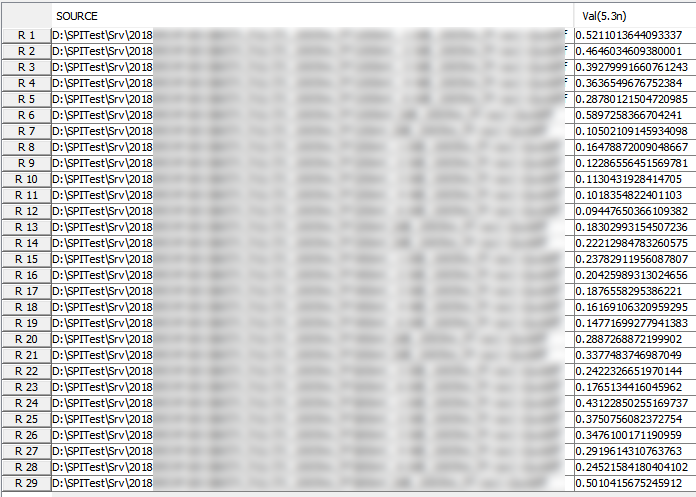 For each of the test cases, the post-processed AMI result is saved to an individual .csv file. All these csv files are also combined and then concatenated side-by-side with original input condition. The end result is a table with input condition at the left and associated AMI parameters at the right. This table will serve as pre-set data table for our AMI models to be released. The columns boxed in blue above are those required for SPISim’s AMI spec models. These columns has header named exactly the same as those in the ami file green boxed below. The row entries for settings of each test case in the csv table is filled in to the boxed in red in ami file below. Now this is not the format to be released to the AMI user. In stead, the design parameter we want to expose to the end user are listed in the red box in the csv table. They have the column headers matching original IP’s design parameters. Also note that this csv table only contains partial results as we didn’t perform full factorial sweep for all ~150000 cases. The design parameters, boxed in red in csv file, need to be able to be mapped to those boxed in blue, the AMI stage’s parameters. 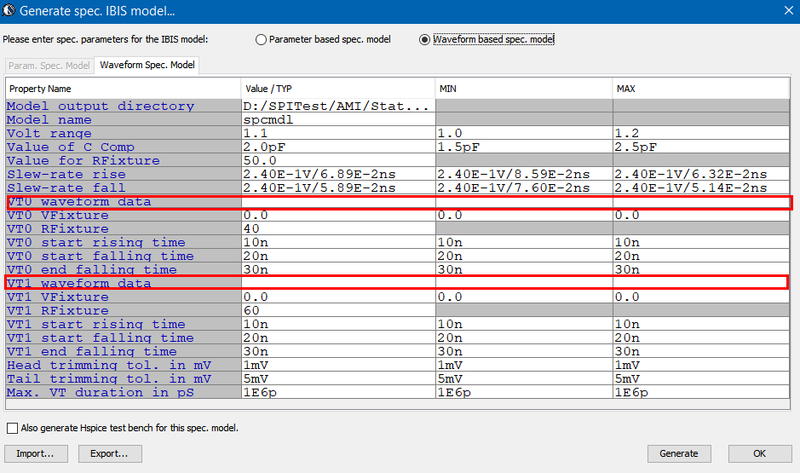 One unique feature of SPISim’s AMI model is it supports of table look up and up to two dimensional linear interpolation for numerical values not found. The set-up is easily done from model config. GUI. 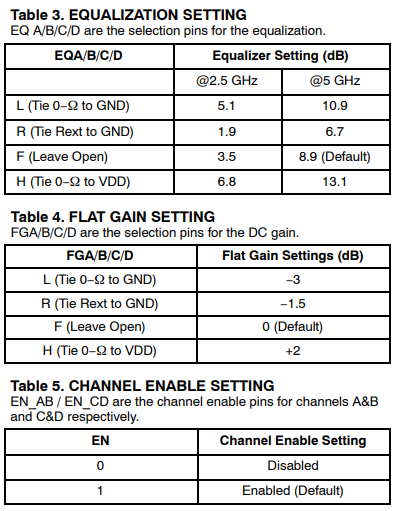 The example below is for PCIe with 11 preset tables. In the final .ami file above, the exposed parameters (boxed in red) are exactly those defined in the original given IP. Their name and values will be used to look-up from the table to find matching row. If up to two rows have no exact match in terms of numerical value, linear interpolation will be performed by the model during initialization. A final matching row or values will be used to assign to the parameters required by spec model. The final results of the create model is one .ami file, one .csv file (plain or encrypted), and one set of .dll/.so file. 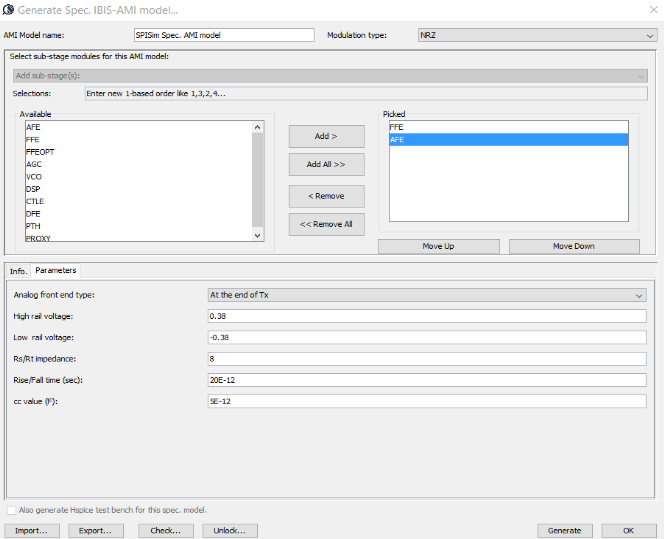 There is no need to write any C/C++ codes or even compilation for the AMI modeling purpose and the SPISim’s spec. models can be used directly. For the post-processing portion, a python/perl/matalb scripts can be used instead if SPIProPro is not sufficient. In this case study, a look-up table based approach is used to create AMI model via reverse engineering. 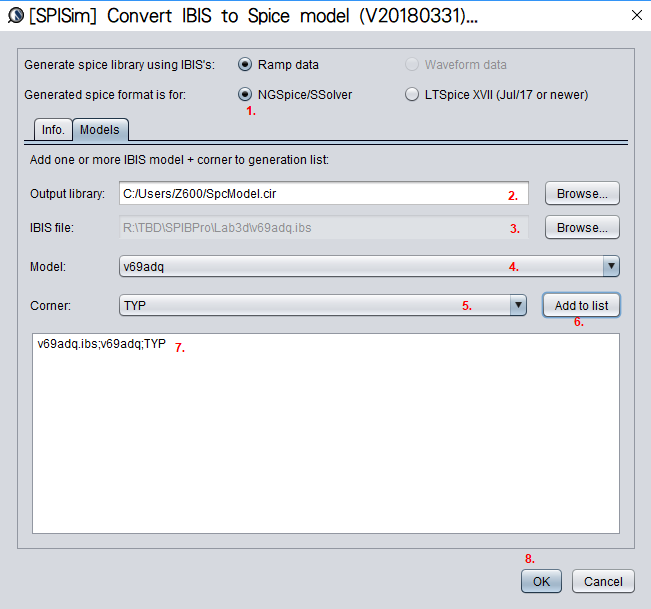 Alternatively, we can create a spice simulation session using our SSolver/ngspice spice engine to simulate these given Tx/Rx spice model directly. The pre-requisite for this approach is that the given hspice model is not encrypted, can be converted to the SSolver/NgSpice based syntax and has no process file involved. Regarding search mechanism, a bi-section searching algorithm is used in our modeling process here as there is only one value (EQ variable) needs to be determined. The amplitude/swing is deterministic and can be found once tr0 simulation results is post-processed. If there are more than one variable involved for optimization , such multi-tap EQs, then a gradient descent based algorithm may be needed if full surface sweep is not practical.